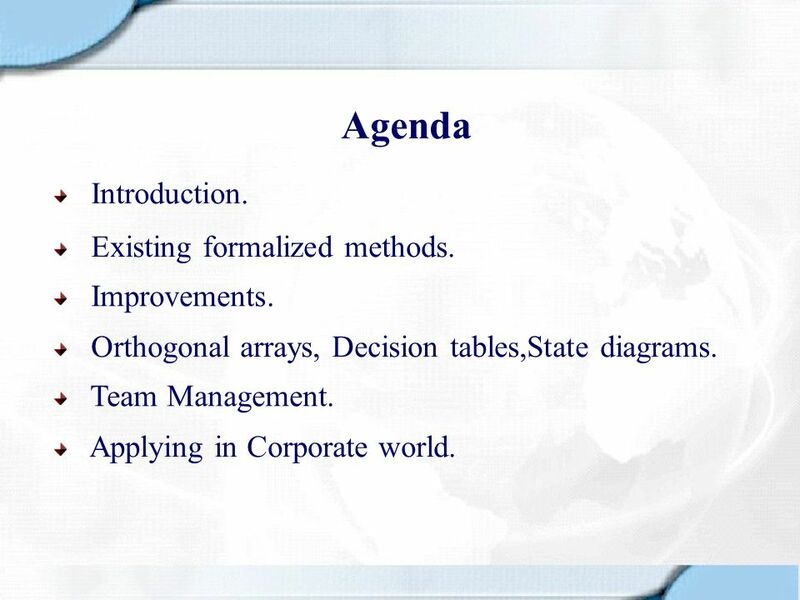 2 Agenda Introduction. Existing formalized methods. Improvements. 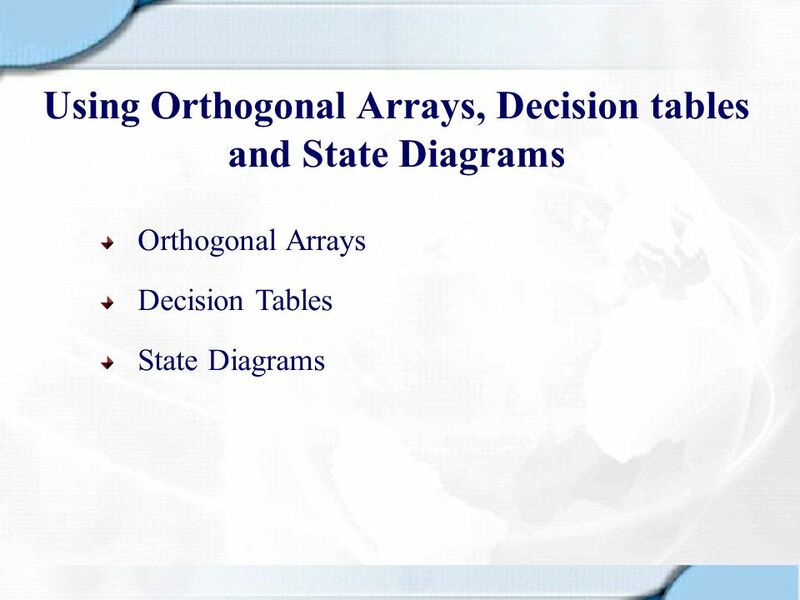 Orthogonal arrays, Decision tables,State diagrams. Team Management. Applying in Corporate world. 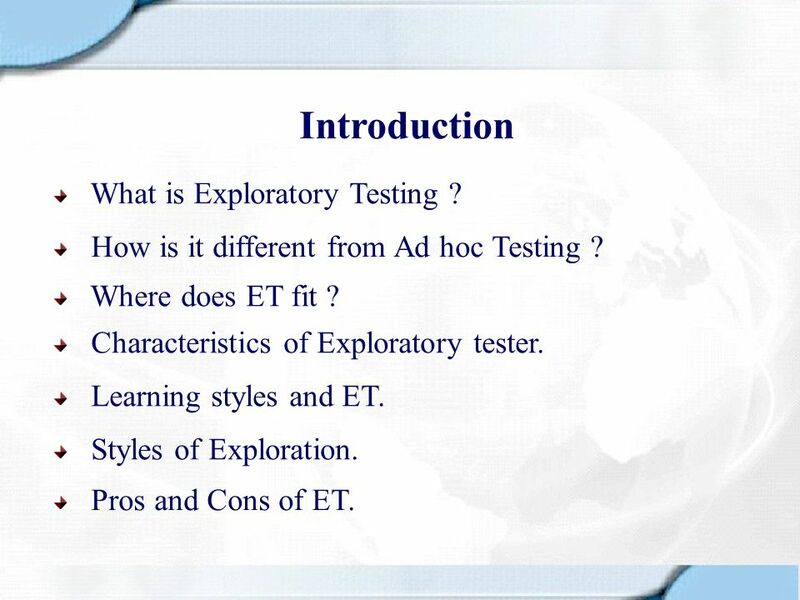 3 Introduction What is Exploratory Testing ? 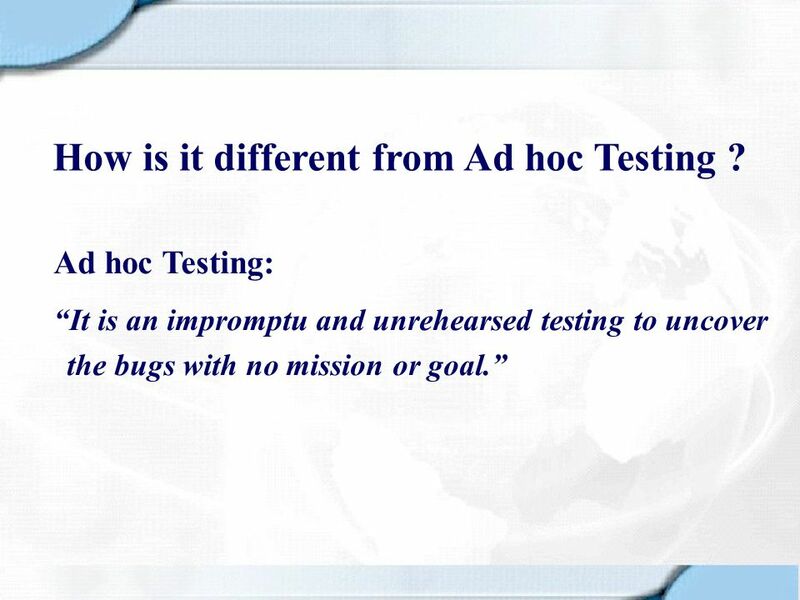 How is it different from Ad hoc Testing ? Where does ET fit ? 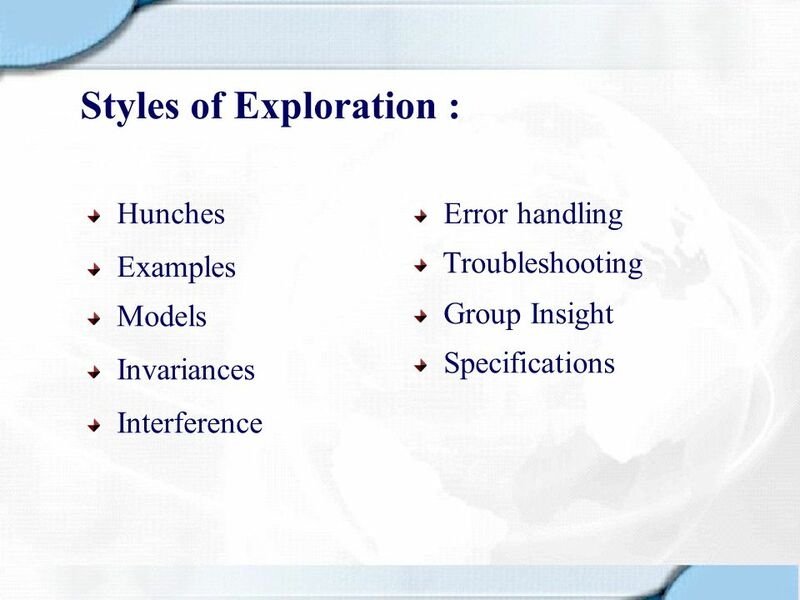 Characteristics of Exploratory tester. 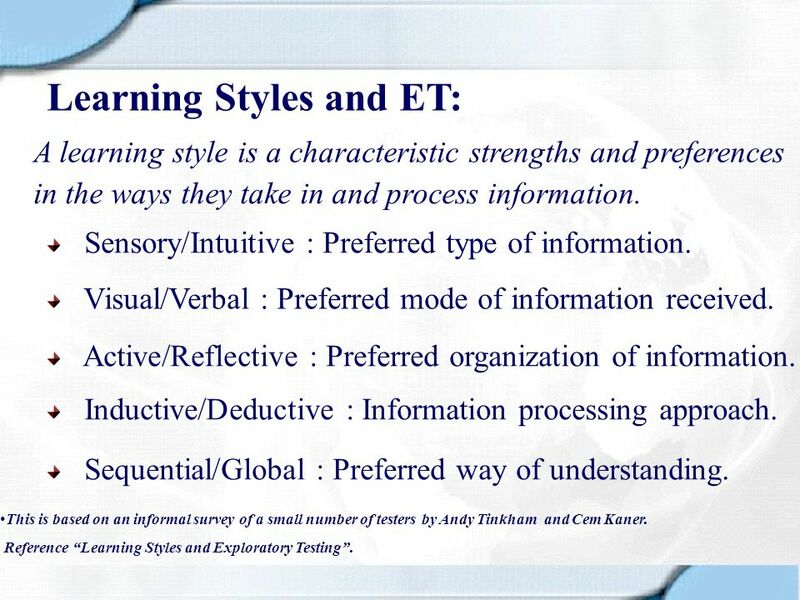 Learning styles and ET. 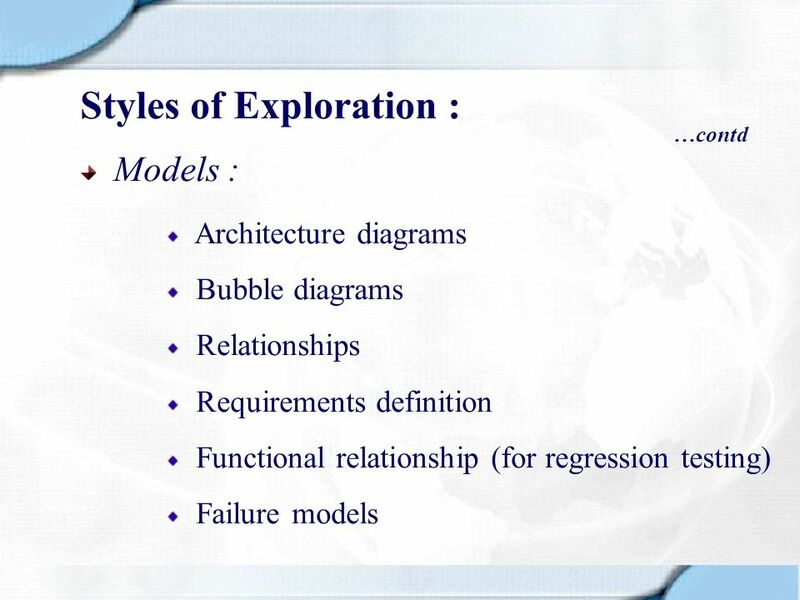 Styles of Exploration. Pros and Cons of ET. planning, running tests, and reporting / troubleshooting results." - Dr. Cem Kaner. 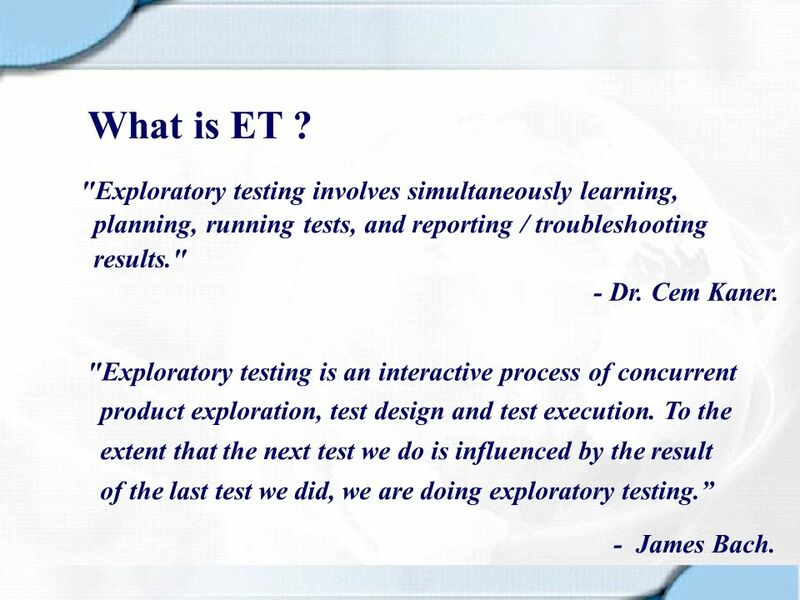 "Exploratory testing is an interactive process of concurrent product exploration, test design and test execution. To the extent that the next test we do is influenced by the result of the last test we did, we are doing exploratory testing.” - James Bach. 5 How is it different from Ad hoc Testing ? 7 Where does ET fit ? No specifications or little documentation available. No time to specify,script and test. Thread Pulling. When the application does not have any future releases. 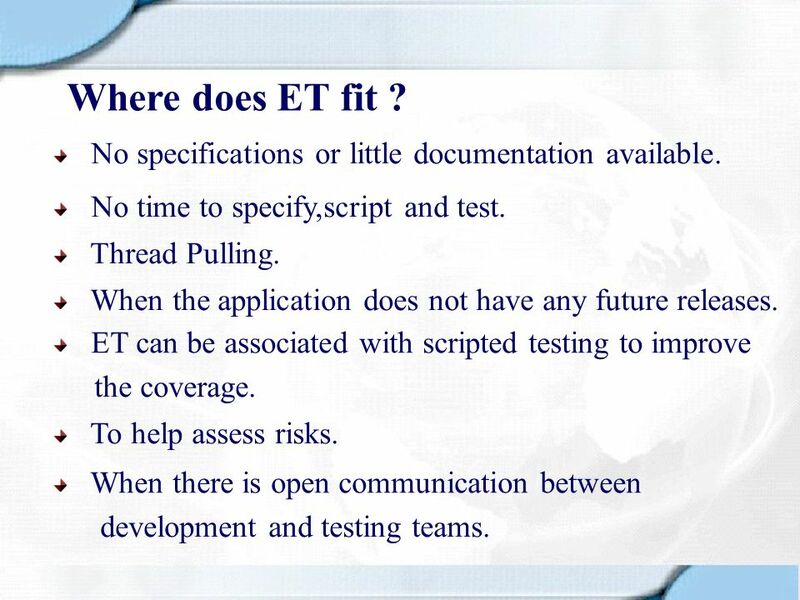 ET can be associated with scripted testing to improve the coverage. To help assess risks. When there is open communication between development and testing teams. Design and Excel : An exploratory tester is first and foremost a Test Designer. 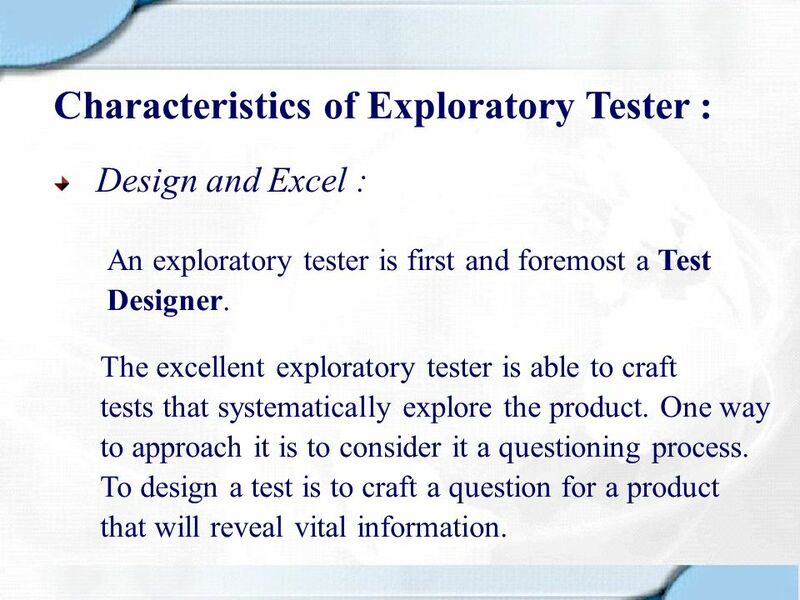 The excellent exploratory tester is able to craft tests that systematically explore the product. One way to approach it is to consider it a questioning process. To design a test is to craft a question for a product that will reveal vital information. 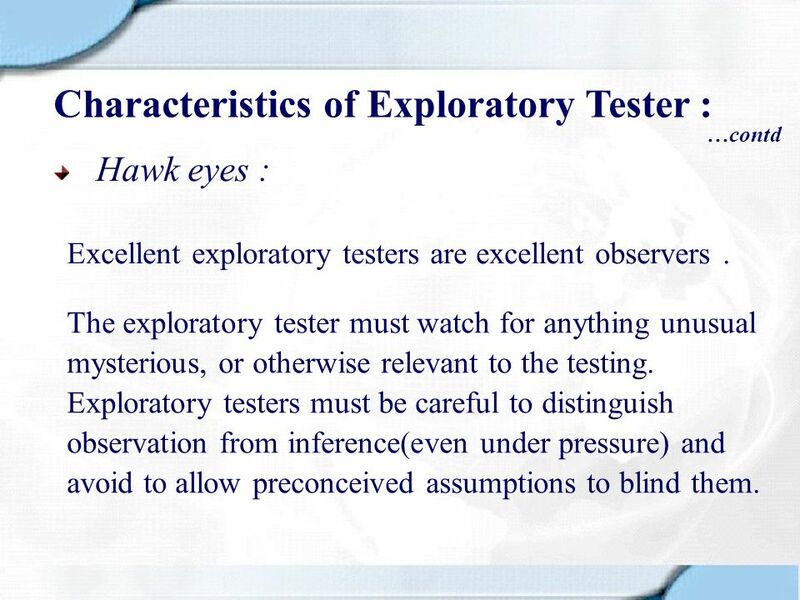 …contd Hawk eyes : Excellent exploratory testers are excellent observers . 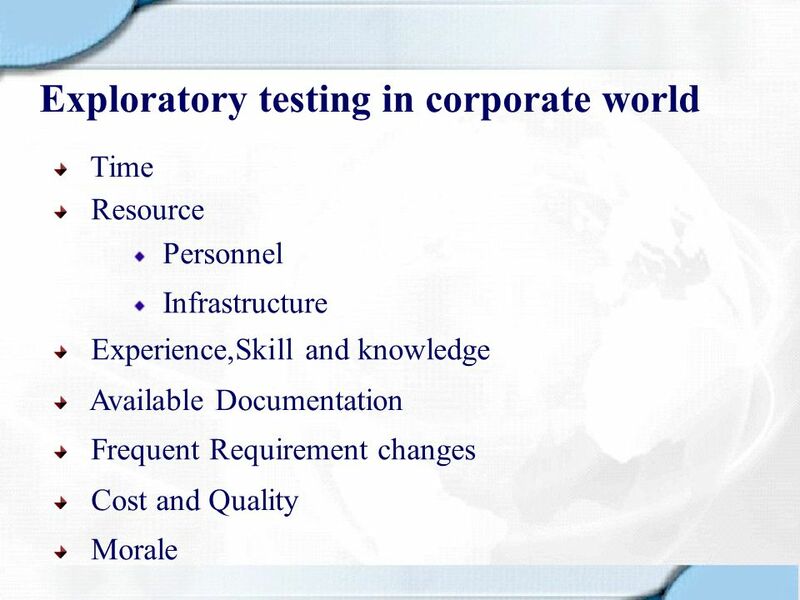 The exploratory tester must watch for anything unusual mysterious, or otherwise relevant to the testing. Exploratory testers must be careful to distinguish observation from inference(even under pressure) and avoid to allow preconceived assumptions to blind them. 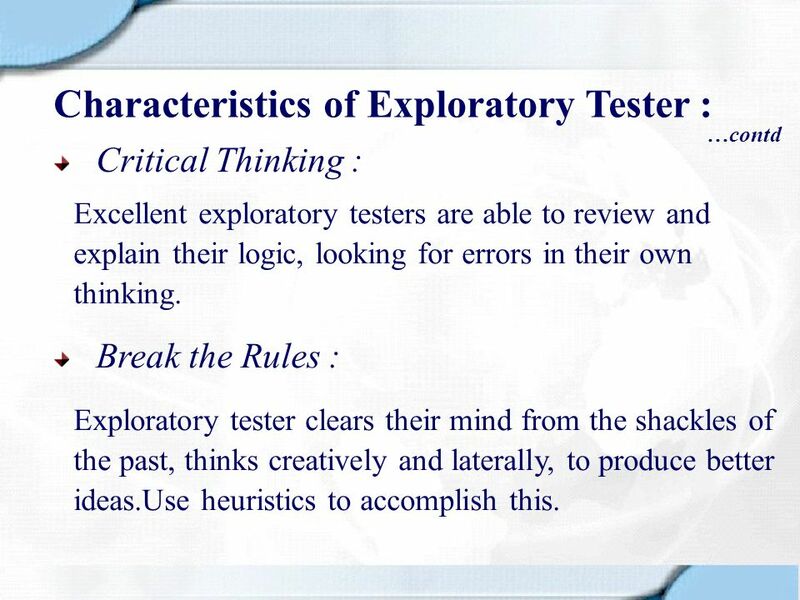 …contd Critical Thinking : Excellent exploratory testers are able to review and explain their logic, looking for errors in their own thinking. Break the Rules : Exploratory tester clears their mind from the shackles of the past, thinks creatively and laterally, to produce better ideas.Use heuristics to accomplish this. 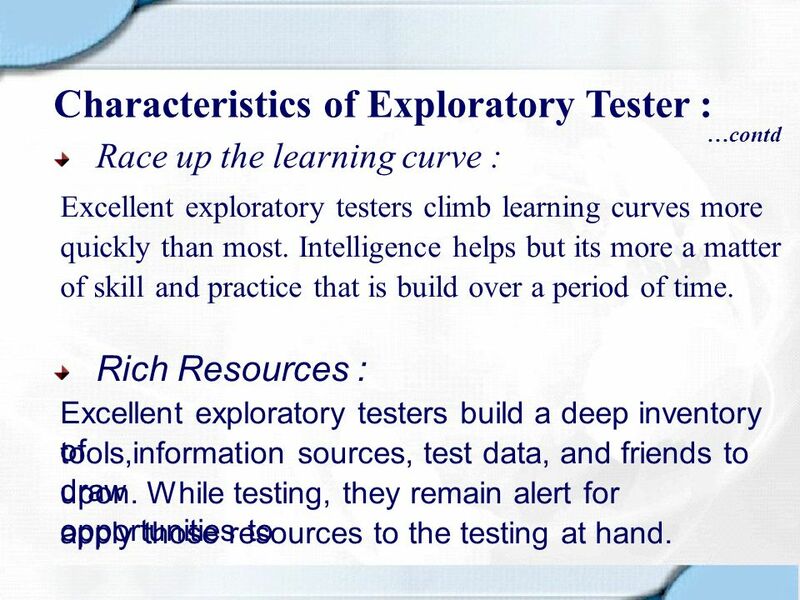 …contd Race up the learning curve : Excellent exploratory testers climb learning curves more quickly than most. Intelligence helps but its more a matter of skill and practice that is build over a period of time. Rich Resources : Excellent exploratory testers build a deep inventory of tools,information sources, test data, and friends to draw upon. 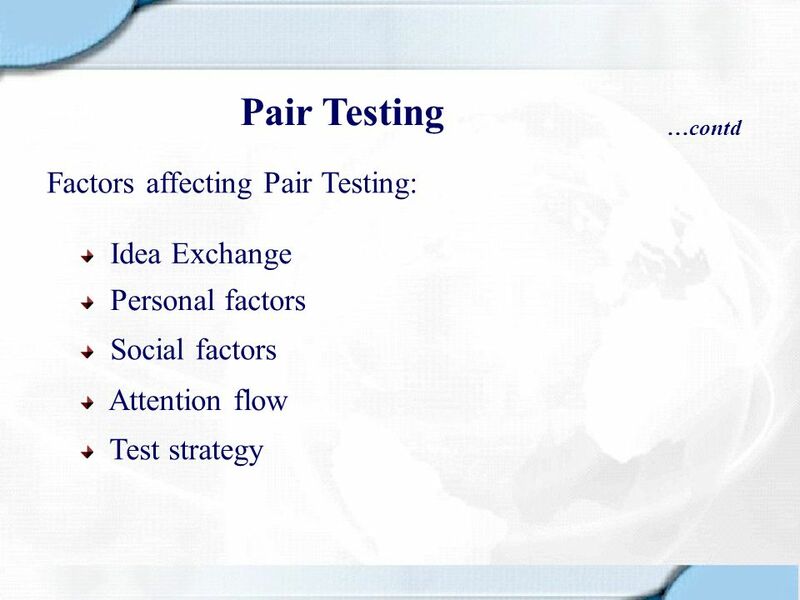 While testing, they remain alert for opportunities to apply those resources to the testing at hand. …contd Manage and Succeed : Excellent exploratory testers know the value of their precious time.They differentiate between a dead end and a promising lead. They follow their main mission while taking deviations to ensure the coverage. 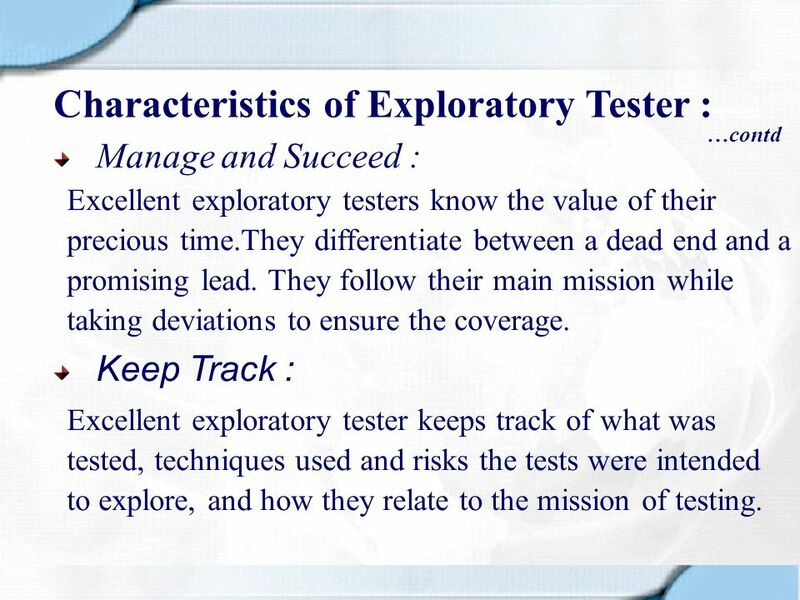 Keep Track : Excellent exploratory tester keeps track of what was tested, techniques used and risks the tests were intended to explore, and how they relate to the mission of testing. A learning style is a characteristic strengths and preferences in the ways they take in and process information. 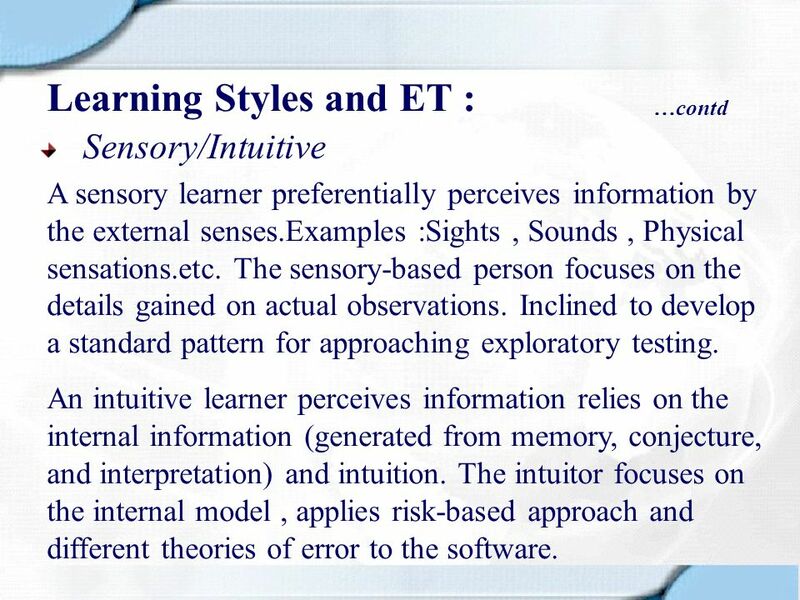 Sensory/Intuitive : Preferred type of information. Visual/Verbal : Preferred mode of information received. Active/Reflective : Preferred organization of information. 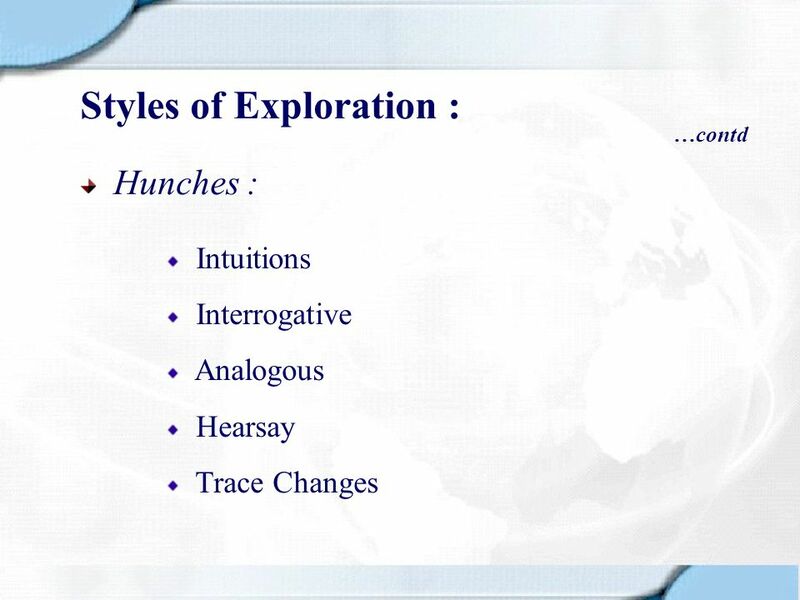 Inductive/Deductive : Information processing approach. Sequential/Global : Preferred way of understanding. This is based on an informal survey of a small number of testers by Andy Tinkham and Cem Kaner. 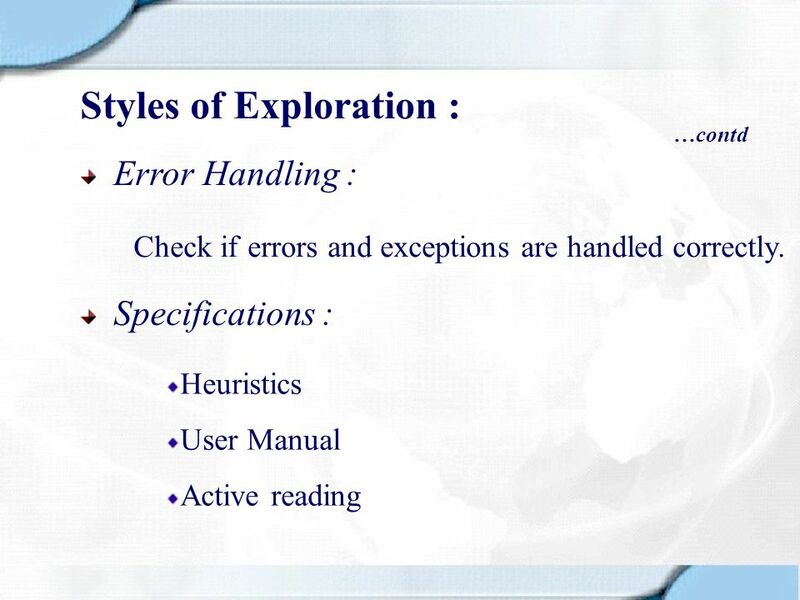 Reference “Learning Styles and Exploratory Testing”. …contd Sensory/Intuitive A sensory learner preferentially perceives information by the external senses.Examples :Sights , Sounds , Physical sensations.etc. The sensory-based person focuses on the details gained on actual observations. Inclined to develop a standard pattern for approaching exploratory testing. An intuitive learner perceives information relies on the internal information (generated from memory, conjecture, and interpretation) and intuition. The intuitor focuses on the internal model , applies risk-based approach and different theories of error to the software. 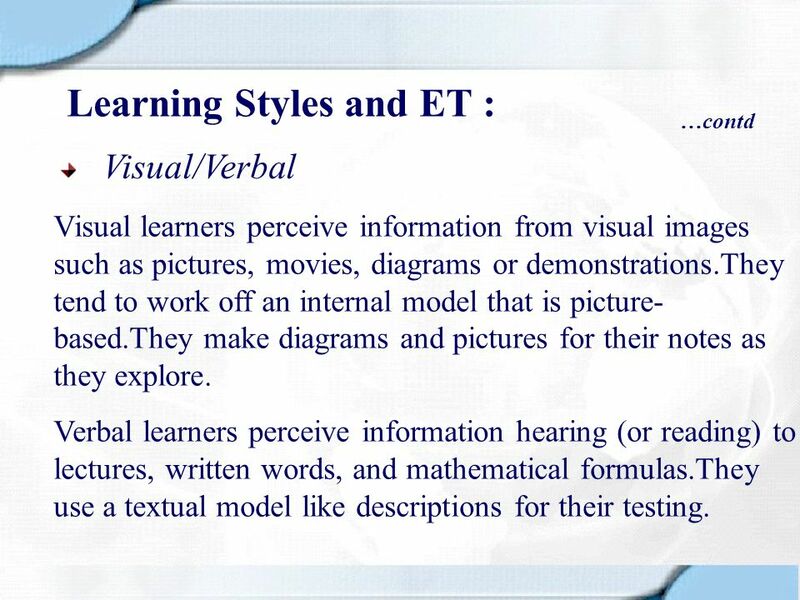 …contd Visual/Verbal Visual learners perceive information from visual images such as pictures, movies, diagrams or demonstrations.They tend to work off an internal model that is picture-based.They make diagrams and pictures for their notes as they explore. Verbal learners perceive information hearing (or reading) to lectures, written words, and mathematical formulas.They use a textual model like descriptions for their testing. 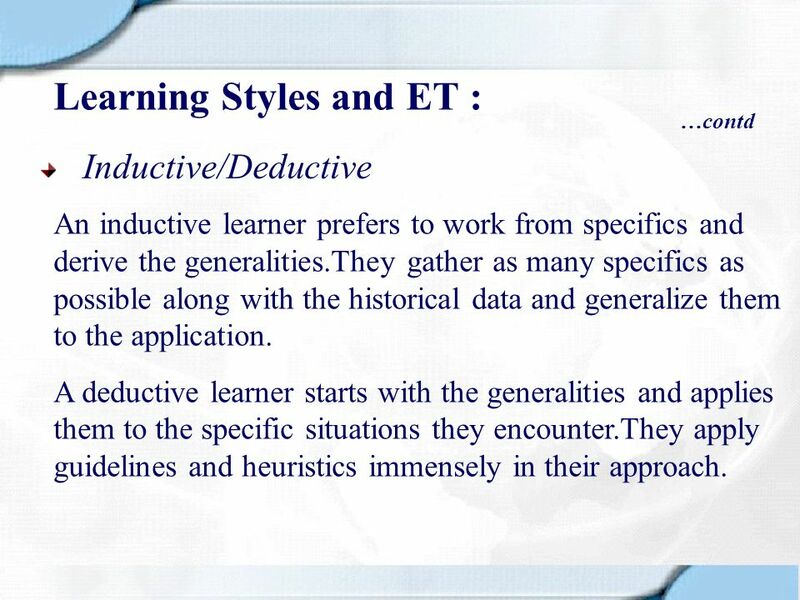 …contd Inductive/Deductive An inductive learner prefers to work from specifics and derive the generalities.They gather as many specifics as possible along with the historical data and generalize them to the application. A deductive learner starts with the generalities and applies them to the specific situations they encounter.They apply guidelines and heuristics immensely in their approach. …contd Active/Reflective : Active learners experiment with the information they receive and like to work in groups and find solutions. They do very rapid hands-on testing.They solicit the feedback from the teams. 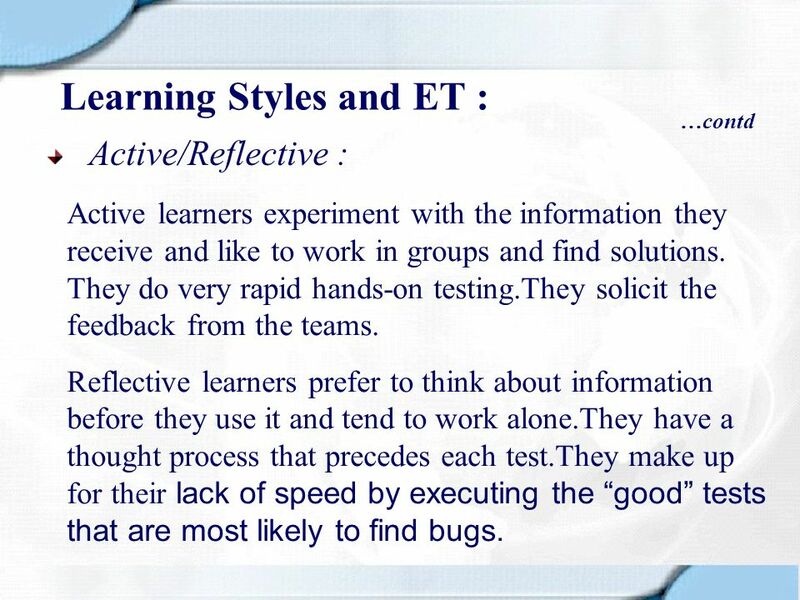 Reflective learners prefer to think about information before they use it and tend to work alone.They have a thought process that precedes each test.They make up for their lack of speed by executing the “good” tests that are most likely to find bugs. 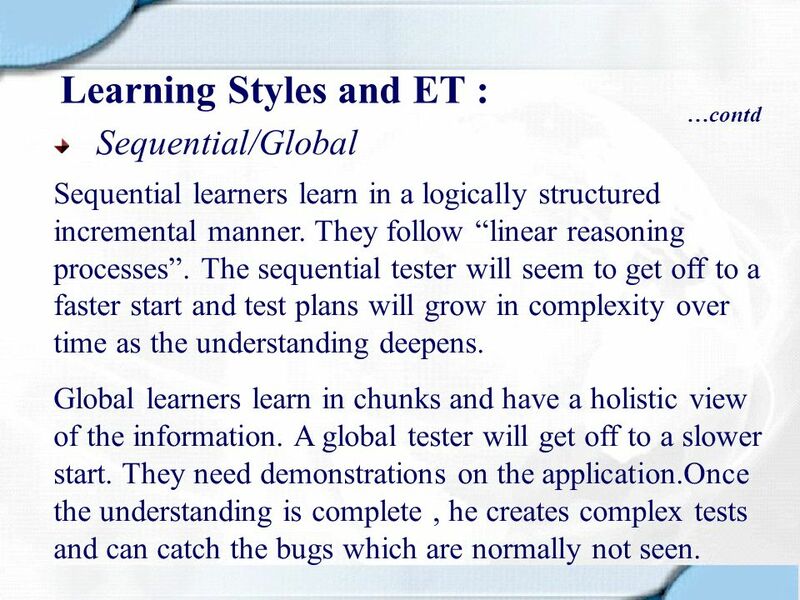 …contd Sequential/Global Sequential learners learn in a logically structured incremental manner. They follow “linear reasoning processes”. The sequential tester will seem to get off to a faster start and test plans will grow in complexity over time as the understanding deepens. Global learners learn in chunks and have a holistic view of the information. A global tester will get off to a slower start. They need demonstrations on the application.Once the understanding is complete , he creates complex tests and can catch the bugs which are normally not seen. 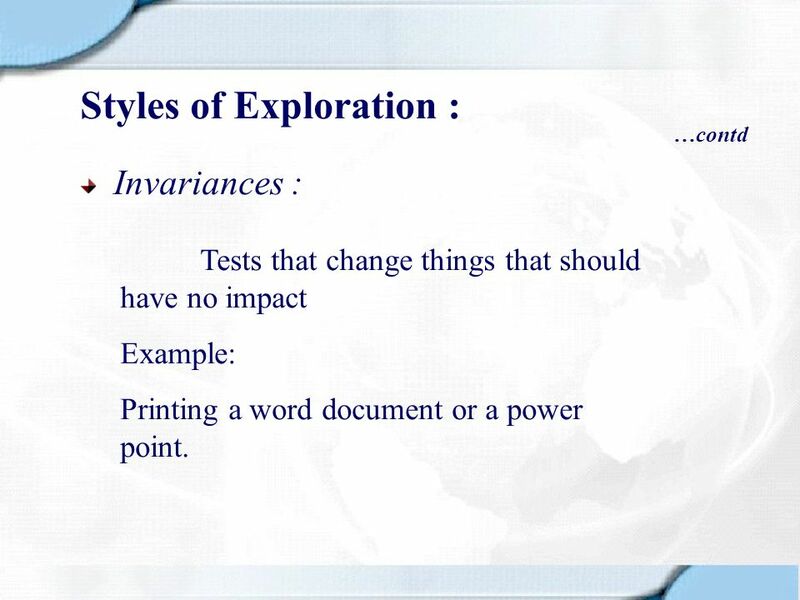 …contd Invariances : Tests that change things that should have no impact Example: Printing a word document or a power point. 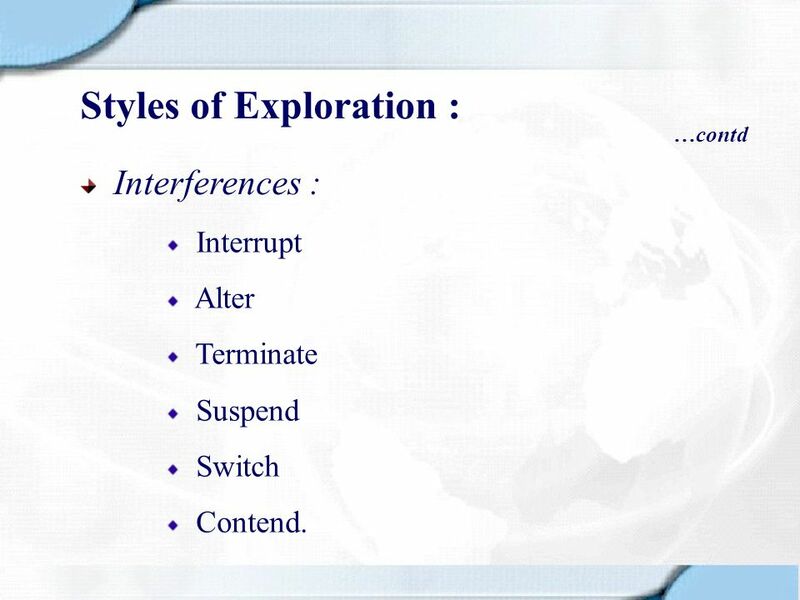 …contd Interferences : Interrupt Alter Terminate Suspend Switch Contend. 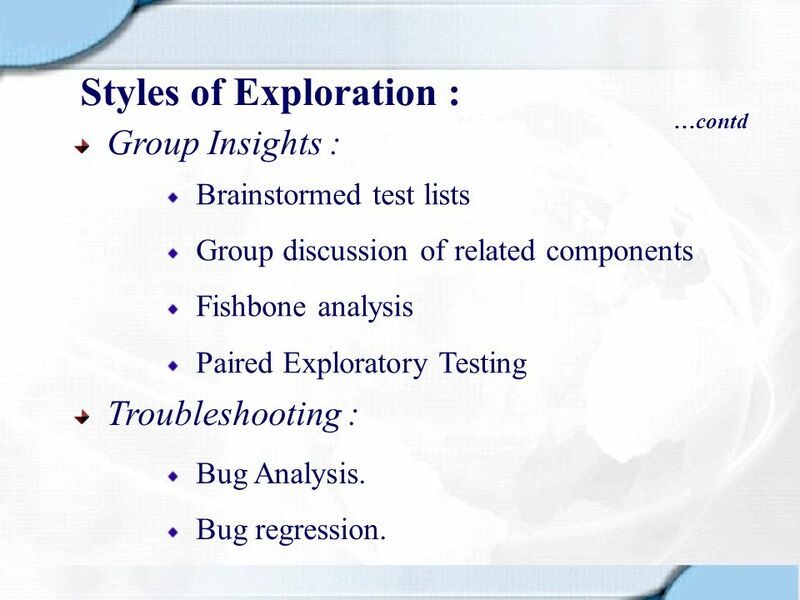 …contd Group Insights : Brainstormed test lists Group discussion of related components Fishbone analysis Paired Exploratory Testing Troubleshooting : Bug Analysis. Bug regression. 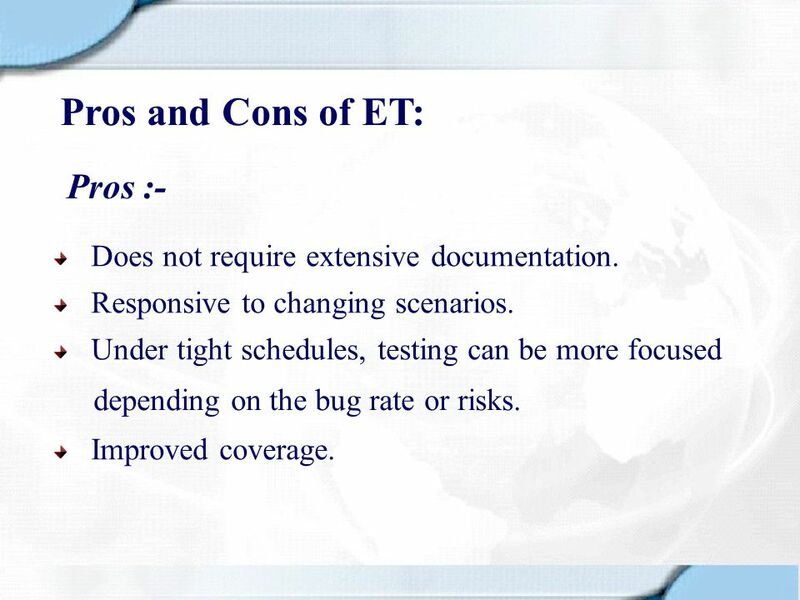 27 Pros and Cons of ET: Pros :- Does not require extensive documentation. Responsive to changing scenarios. 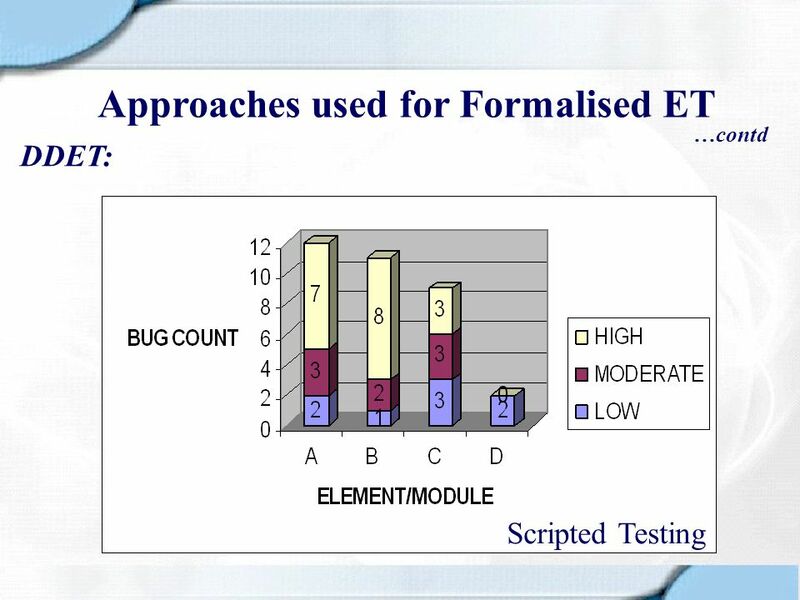 Under tight schedules, testing can be more focused depending on the bug rate or risks. Improved coverage. 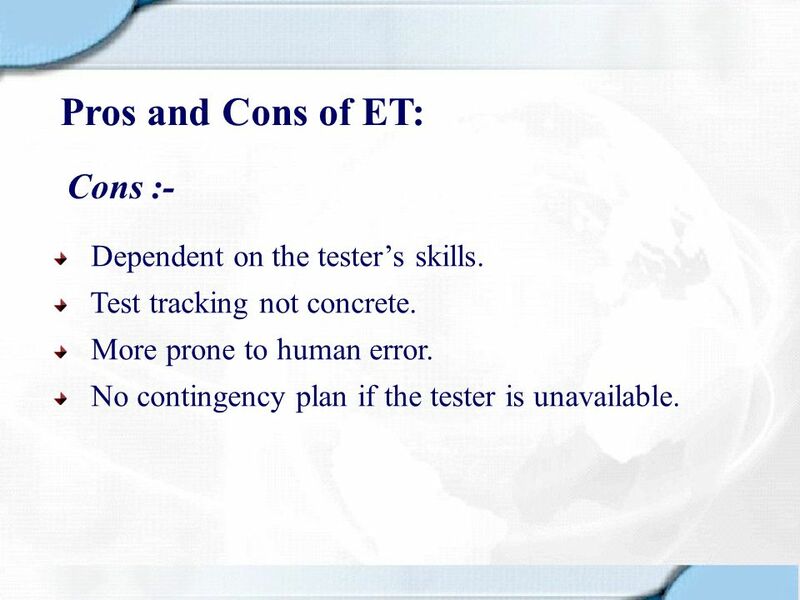 28 Pros and Cons of ET: Cons :- Dependent on the tester’s skills. Test tracking not concrete. More prone to human error. No contingency plan if the tester is unavailable. 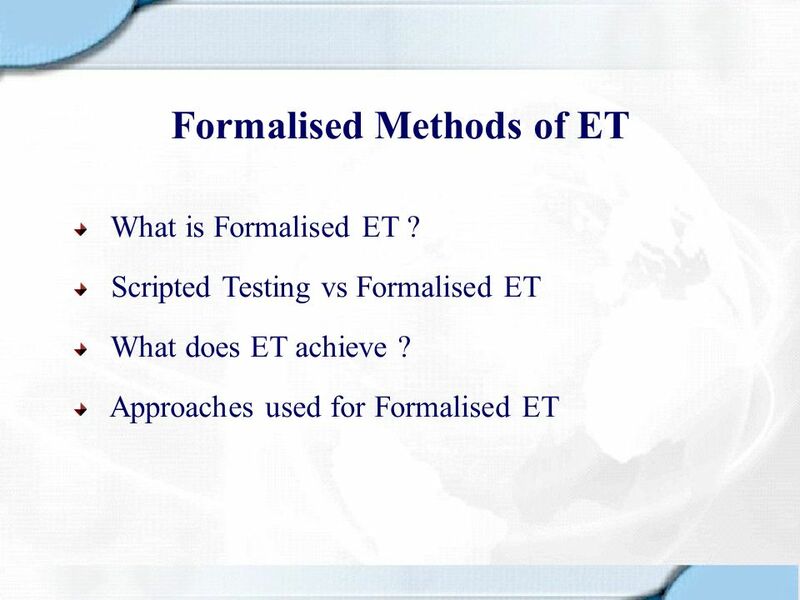 30 What is Formalised ET ? 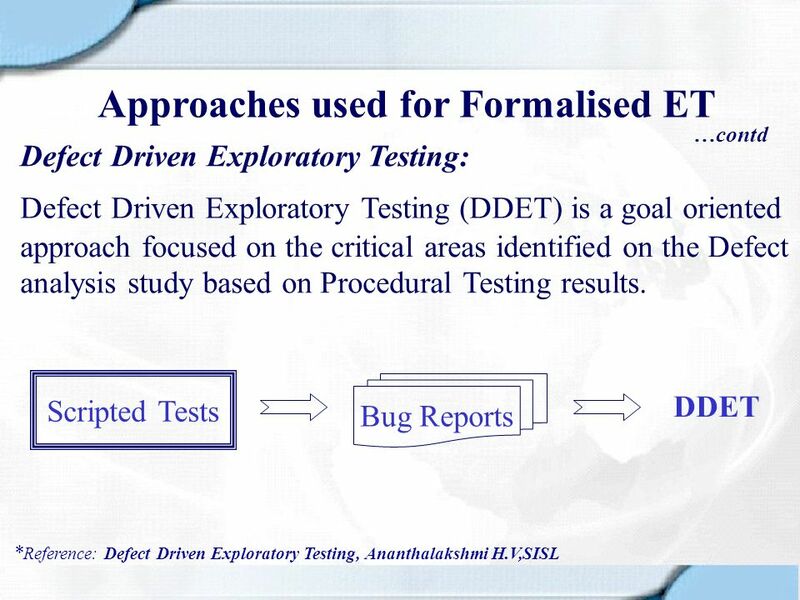 A structured and reasoned approach to exploratory testing is termed as Formalised ET. This approach consists of specific tasks, objectives, and deliverables that makes it a systematic process. 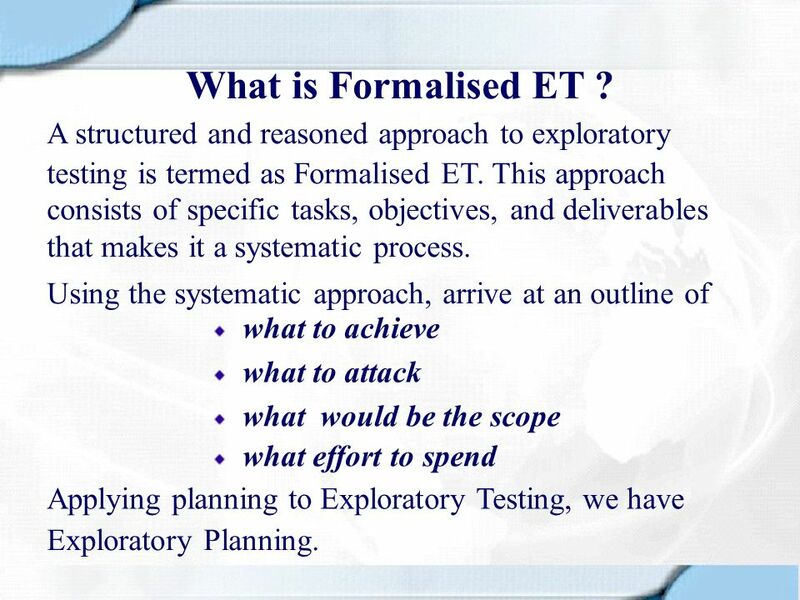 Using the systematic approach, arrive at an outline of what to achieve what to attack what would be the scope what effort to spend Applying planning to Exploratory Testing, we have Exploratory Planning. 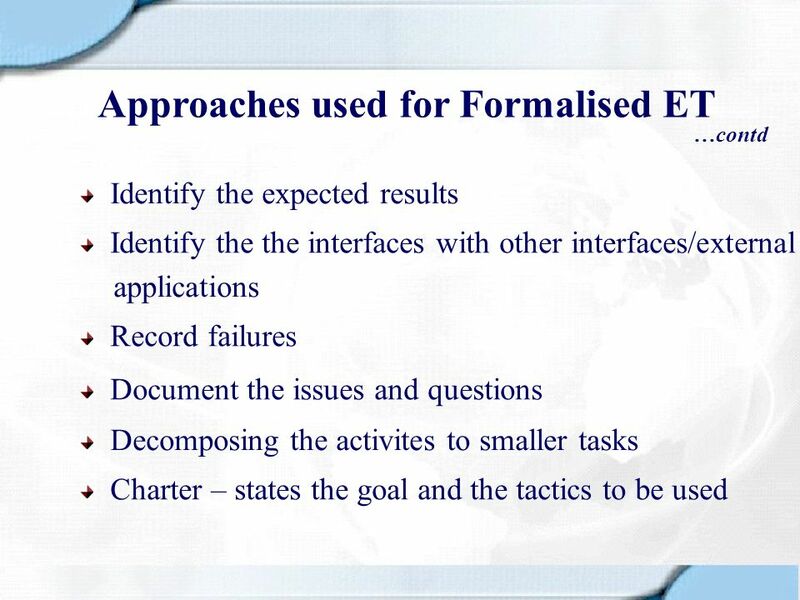 32 What does Formalised ET achieve? 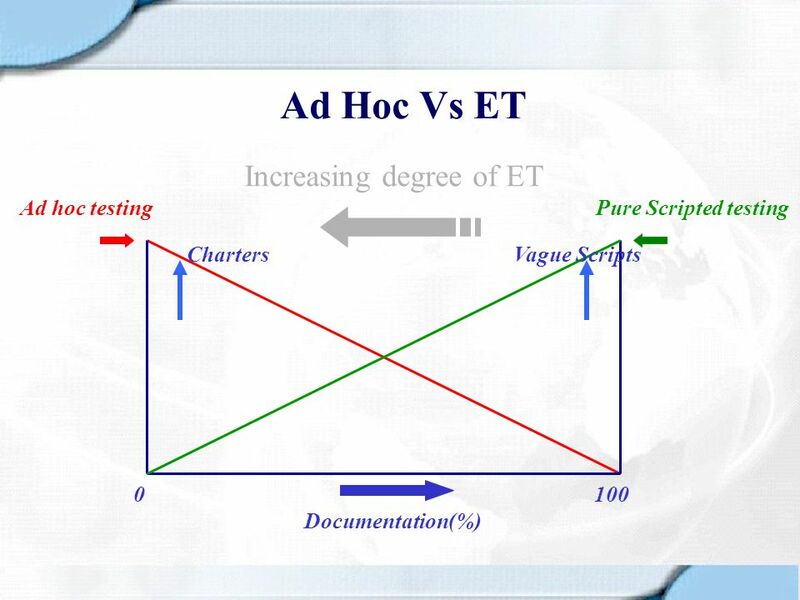 How much planning is done with ET? 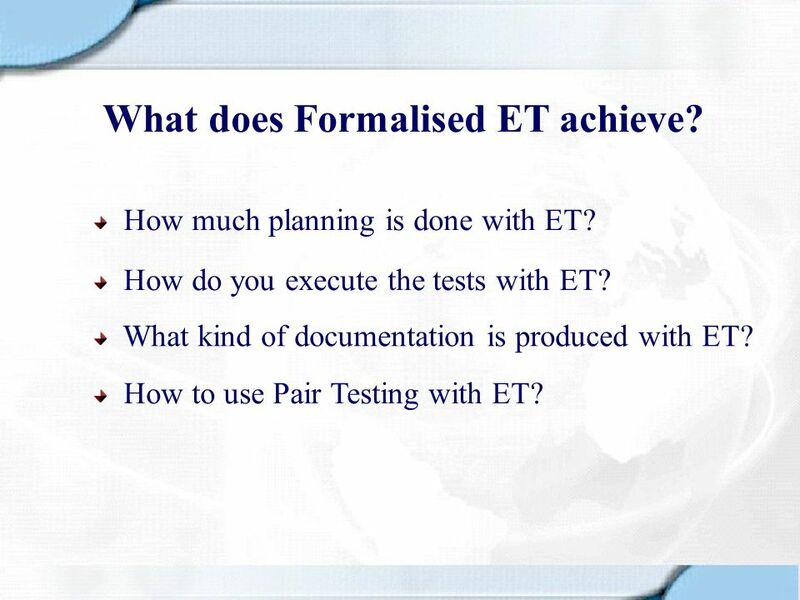 How do you execute the tests with ET? 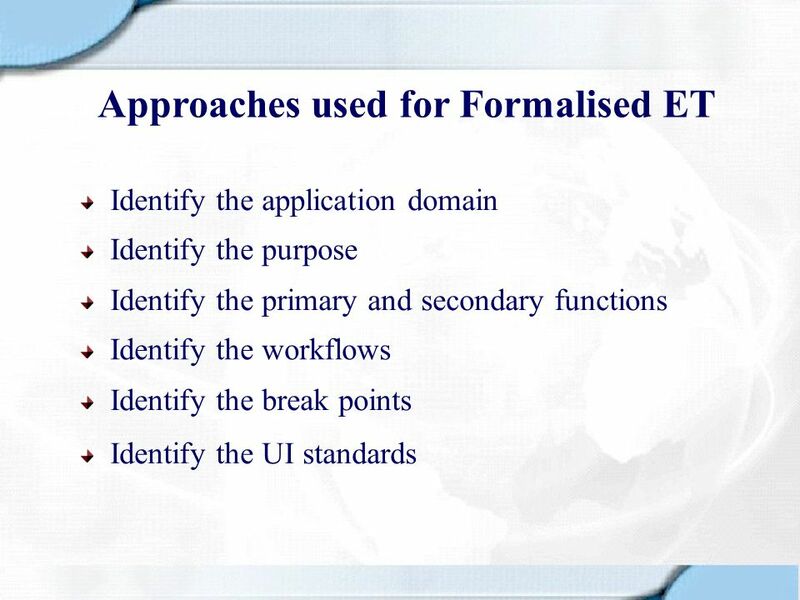 What kind of documentation is produced with ET? How to use Pair Testing with ET? 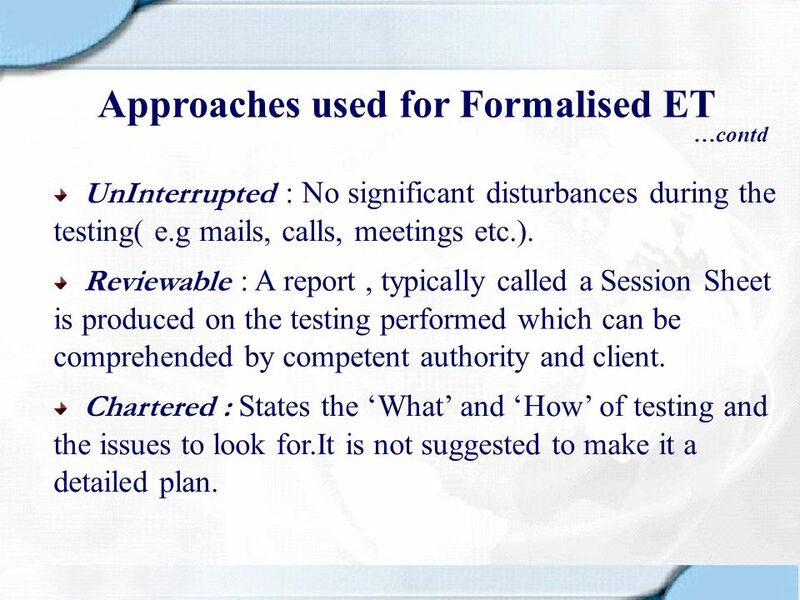 …contd UnInterrupted : No significant disturbances during the testing( e.g mails, calls, meetings etc.). Reviewable : A report , typically called a Session Sheet is produced on the testing performed which can be comprehended by competent authority and client. 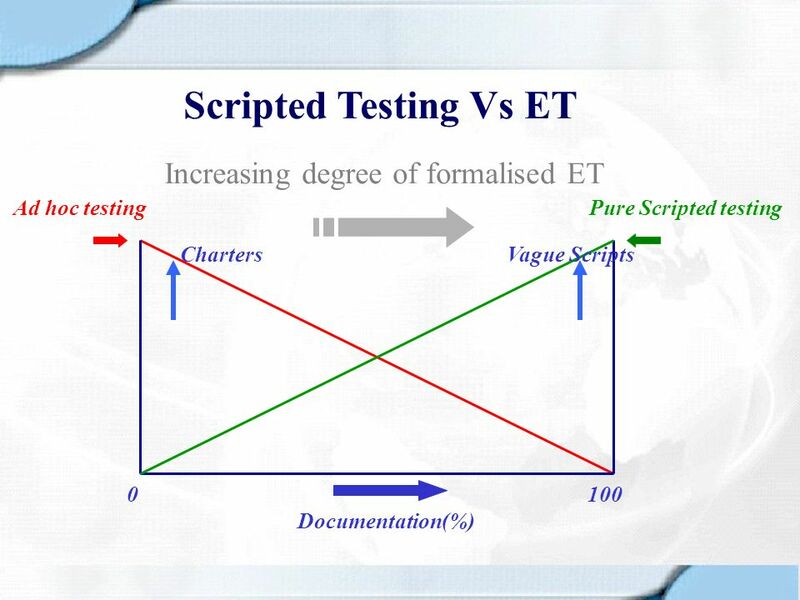 Chartered : States the ‘What’ and ‘How’ of testing and the issues to look for.It is not suggested to make it a detailed plan. 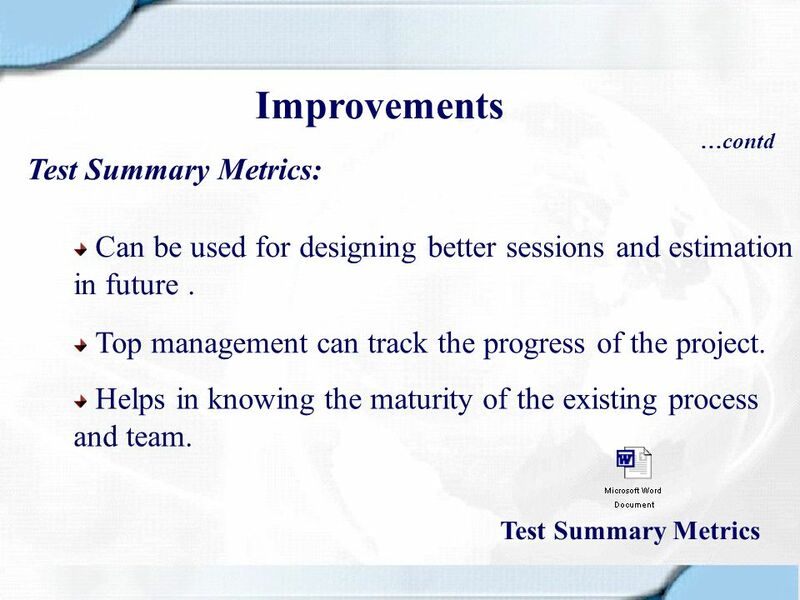 …contd We can separate test sessions into broadly 3 tasks(called the TBS metrics) : Test design and Execution: Scanning the product and looking for problems. Bug investigation and Reporting : Begins when the tester stumbles on something what typically looks to be a fault. 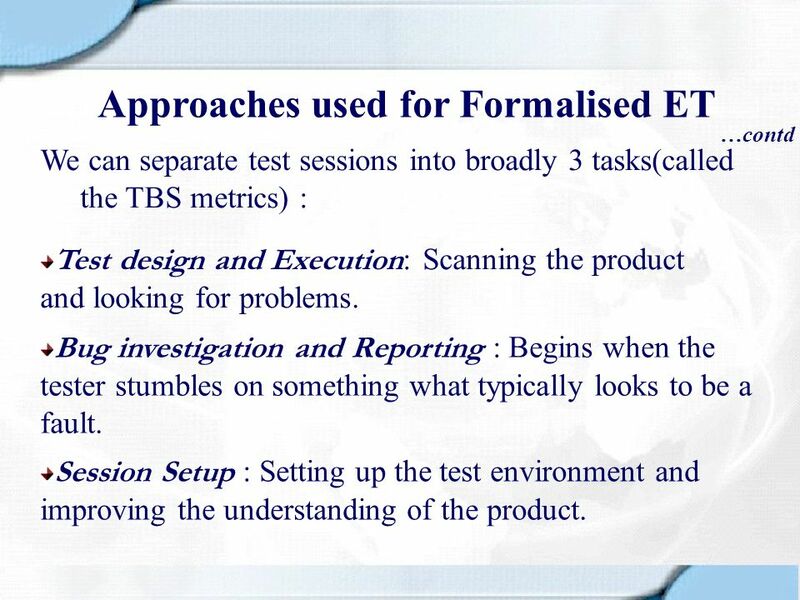 Session Setup : Setting up the test environment and improving the understanding of the product. 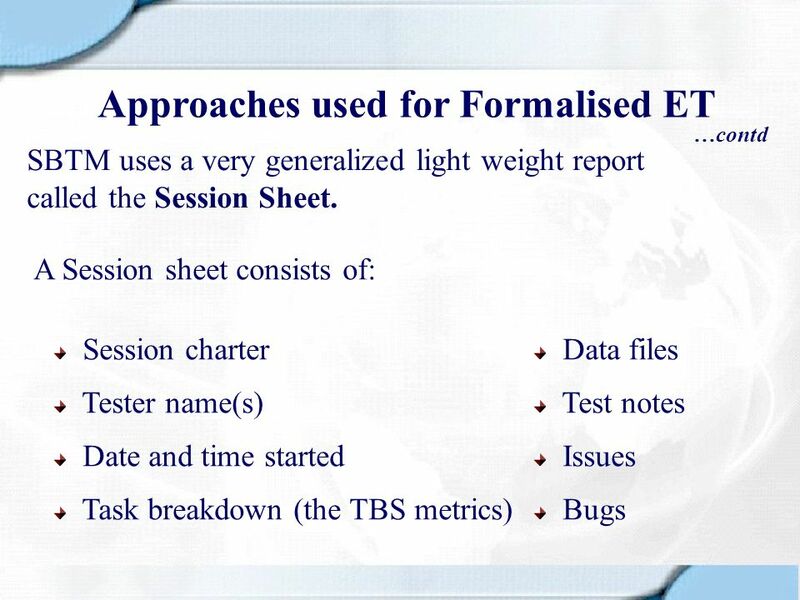 …contd Each session is debriefed. 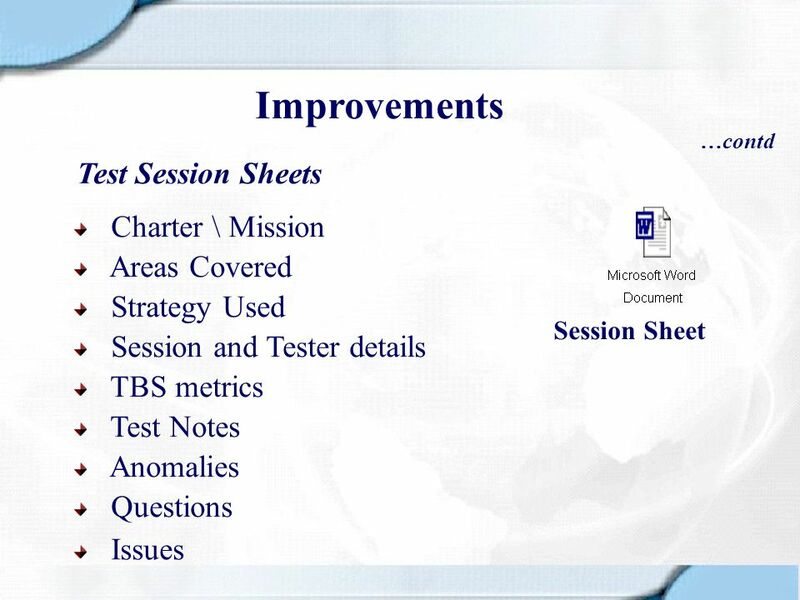 During debriefing the manager reviews the session sheets, makes improvements to the charters, gets feedback from the testers and estimates and plans made for further sessions. 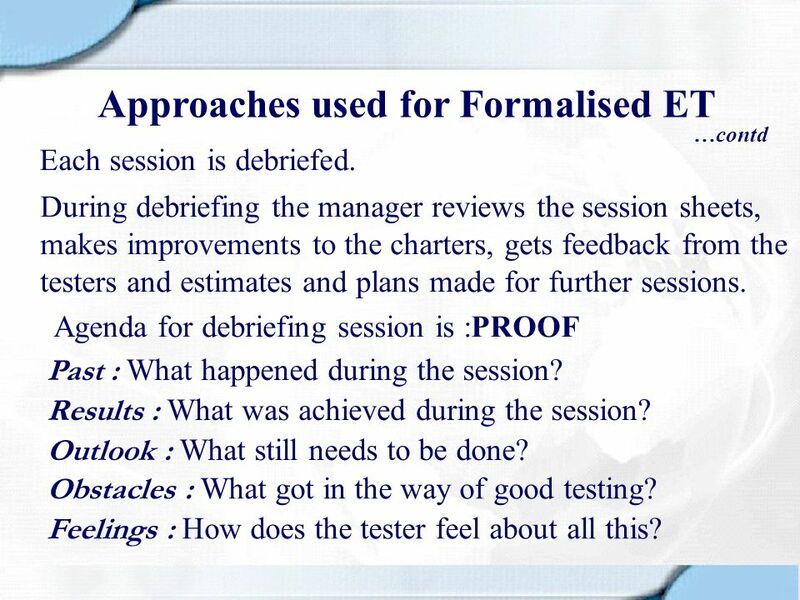 Agenda for debriefing session is :PROOF Past : What happened during the session? 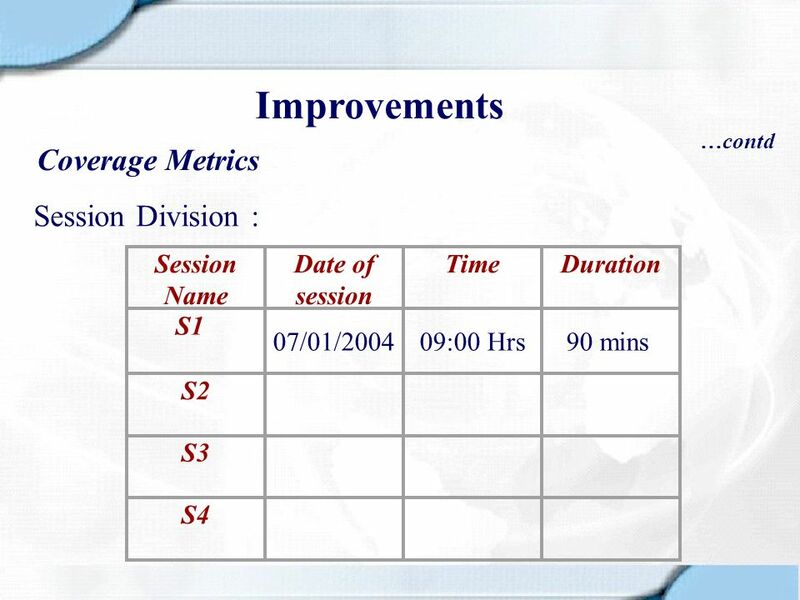 Results : What was achieved during the session? Outlook : What still needs to be done? Obstacles : What got in the way of good testing? Feelings : How does the tester feel about all this? 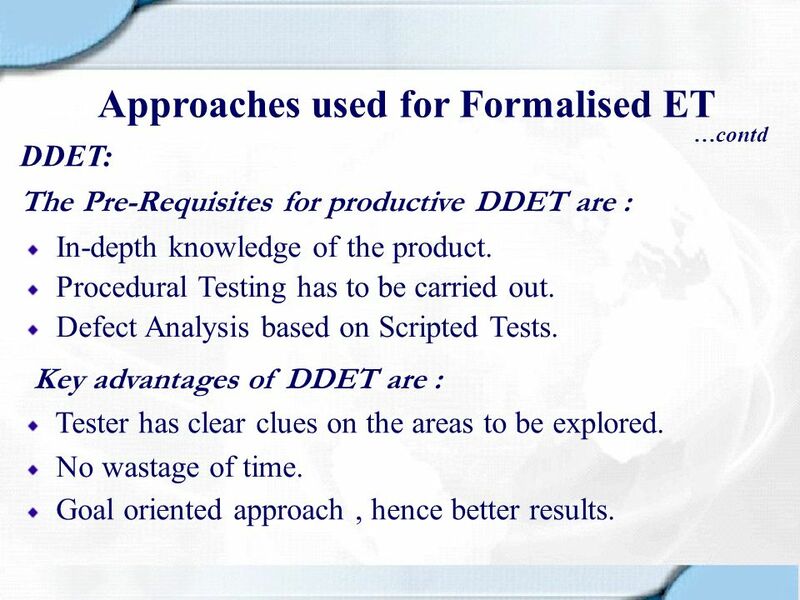 …contd DDET: The Pre-Requisites for productive DDET are : In-depth knowledge of the product. 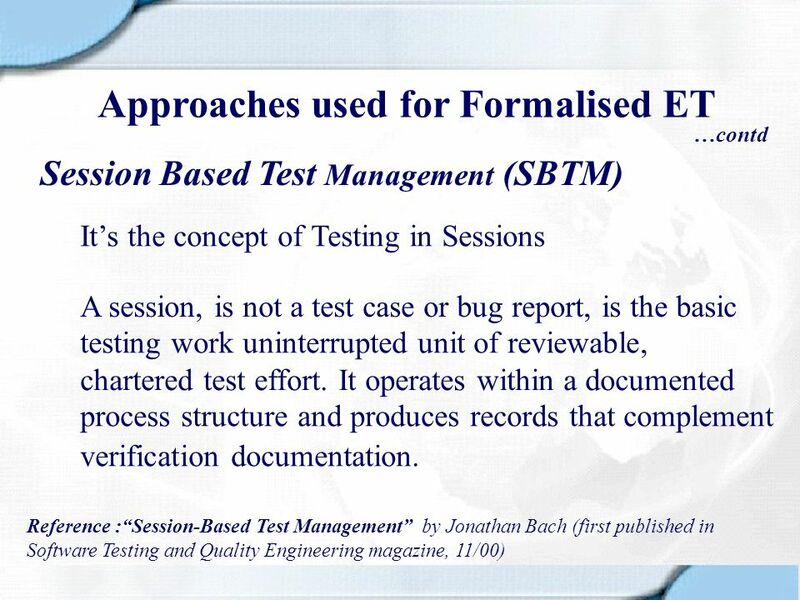 Procedural Testing has to be carried out. 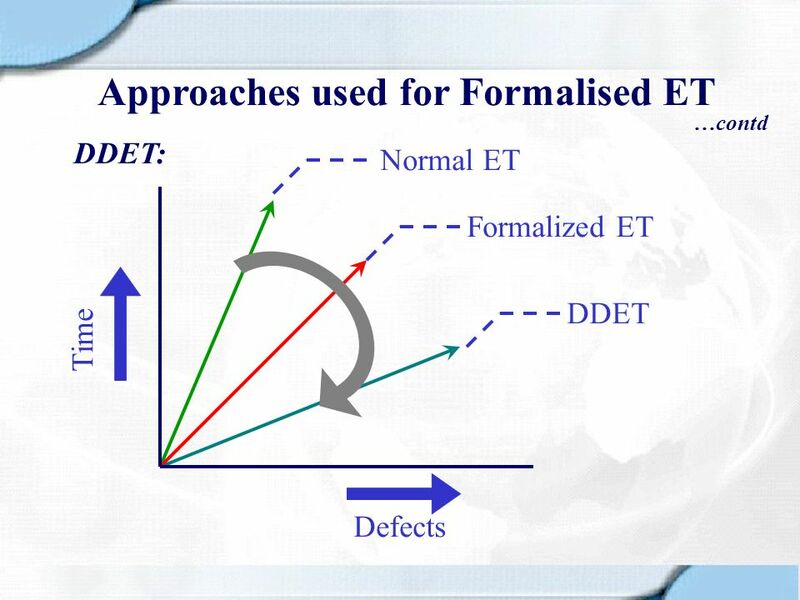 Defect Analysis based on Scripted Tests. 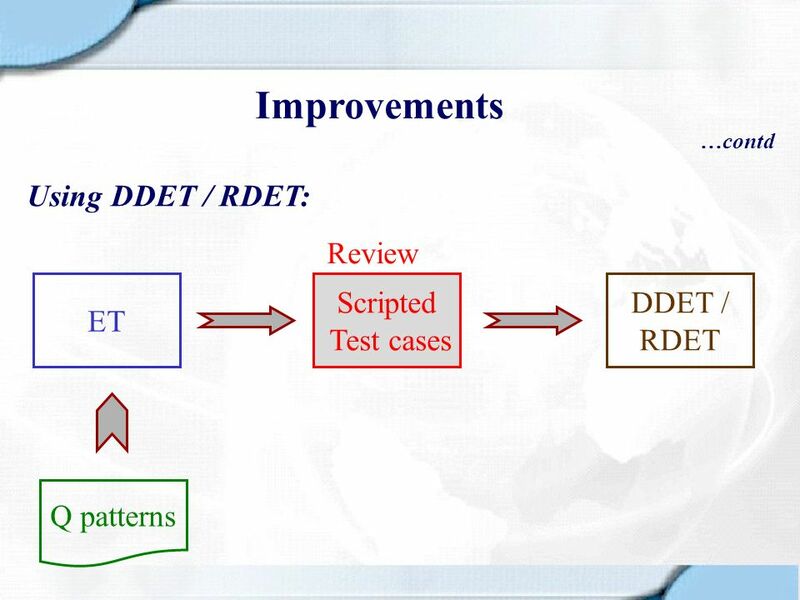 Key advantages of DDET are : Tester has clear clues on the areas to be explored. No wastage of time. Goal oriented approach , hence better results. 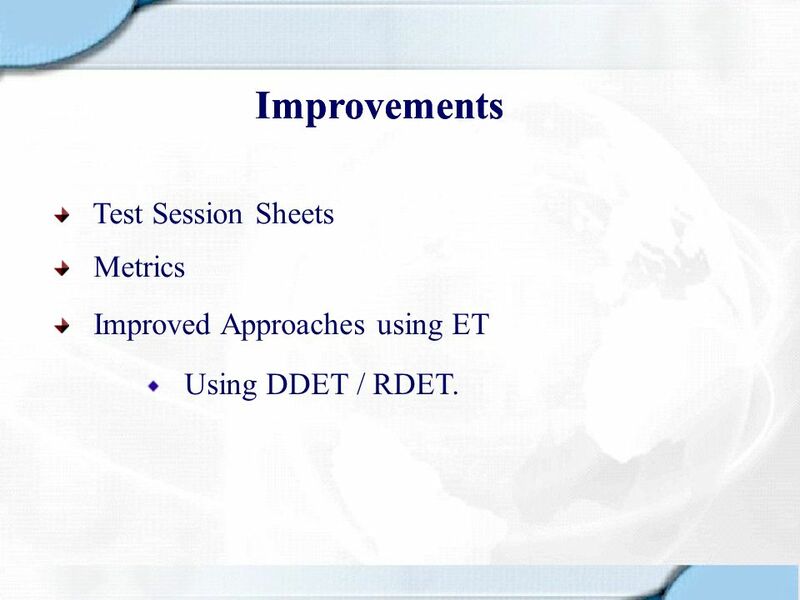 Test Session Sheets Metrics Improved Approaches using ET Using DDET / RDET. 47 Improvements Why “Test Session Sheets” ? 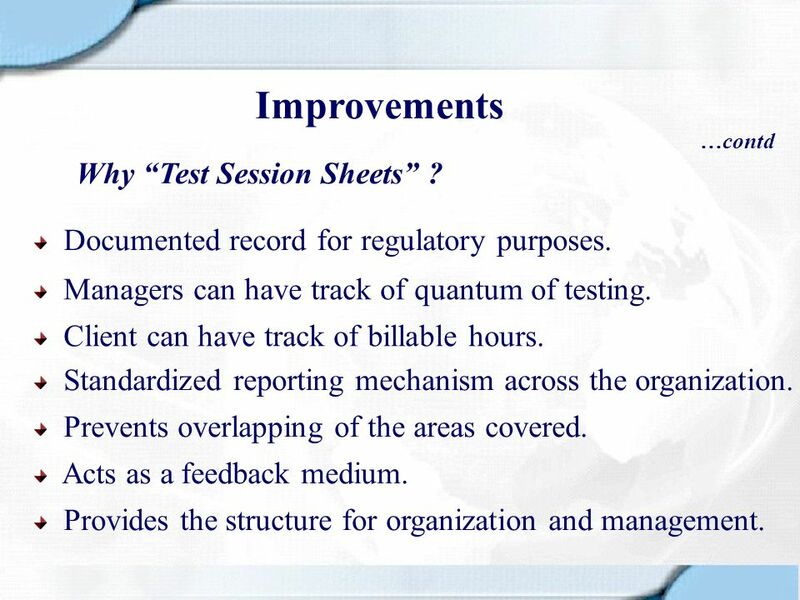 …contd Why “Test Session Sheets” ? Documented record for regulatory purposes. 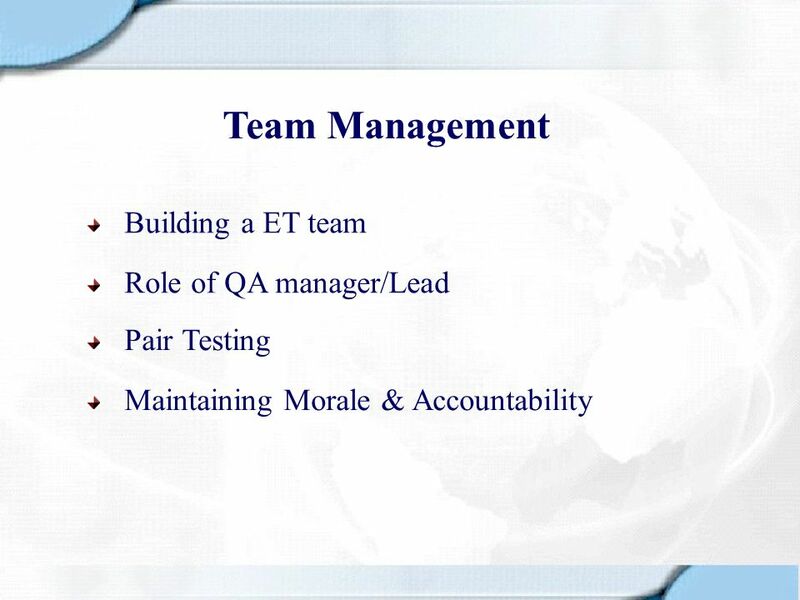 Managers can have track of quantum of testing. Client can have track of billable hours. 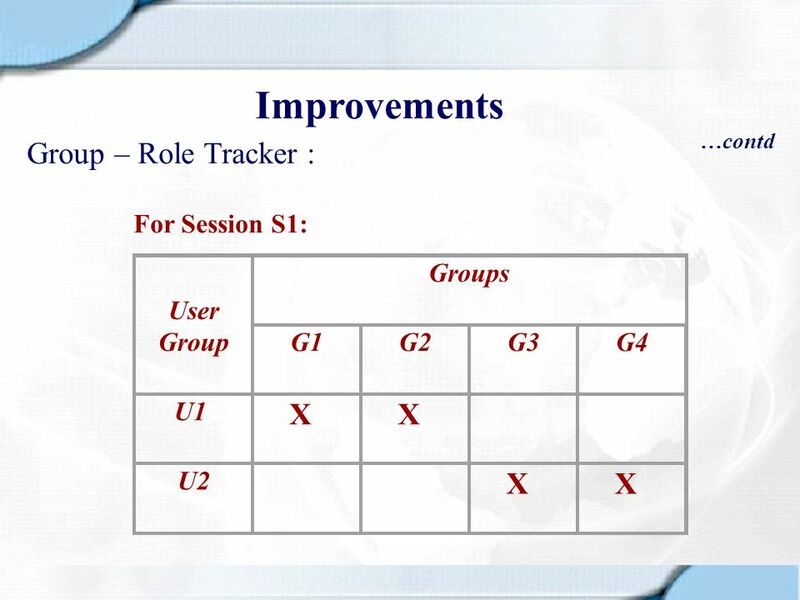 Standardized reporting mechanism across the organization. Prevents overlapping of the areas covered. 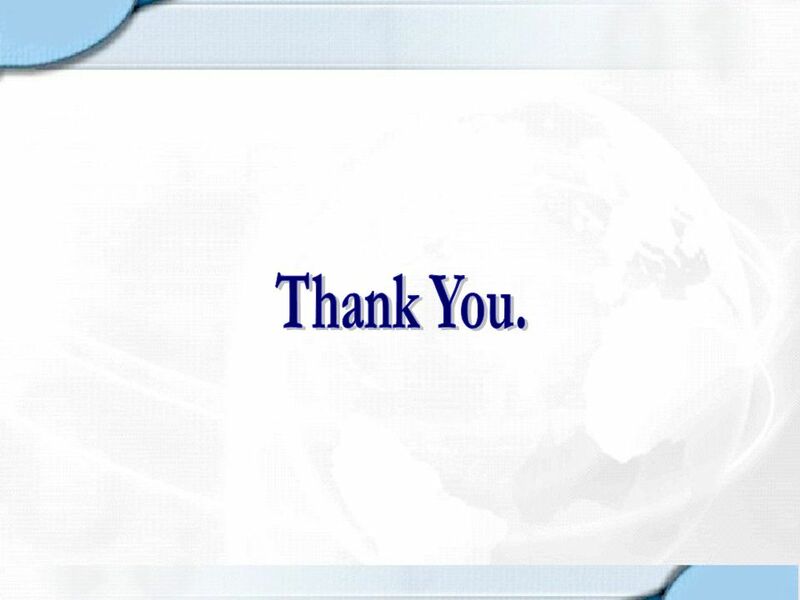 Acts as a feedback medium. Provides the structure for organization and management. 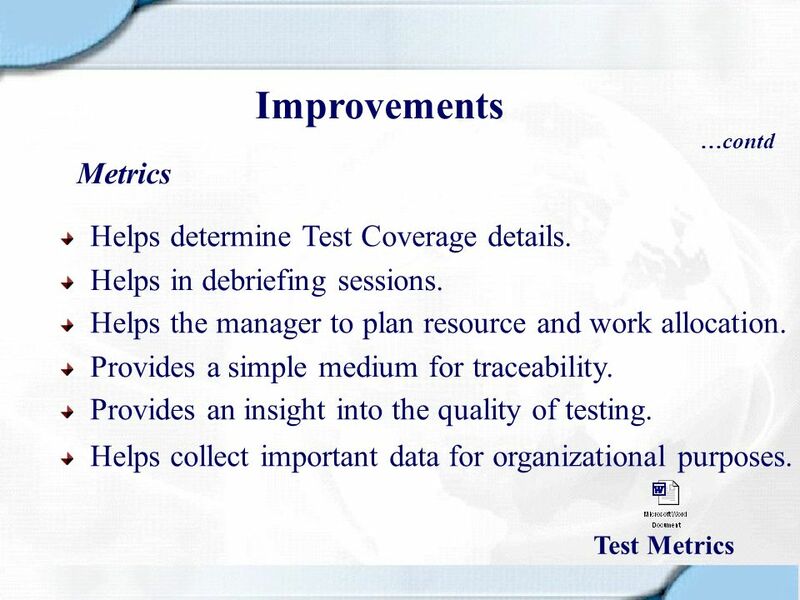 48 Improvements Metrics Helps determine Test Coverage details. 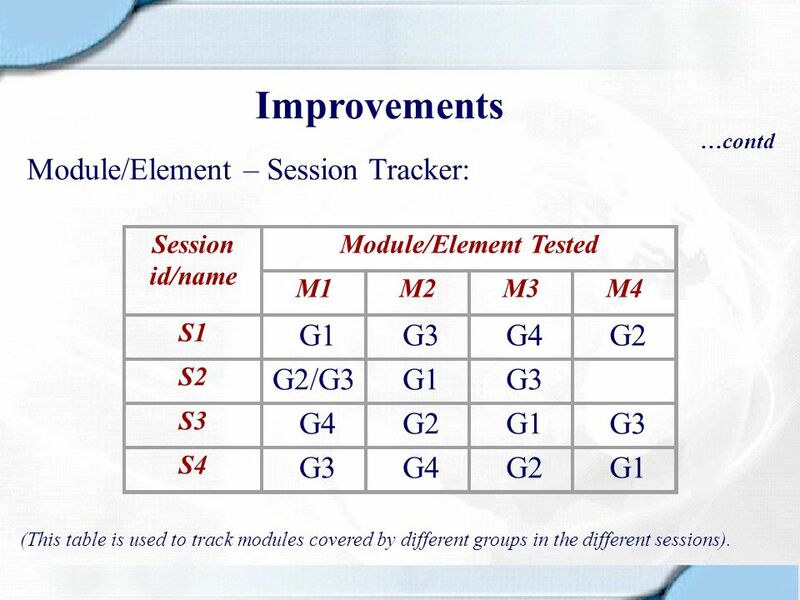 Improvements …contd Module/Element – Session Tracker: Session id/name Module/Element Tested M1 M2 M3 M4 S1 G1 G3 G4 G2 S2 G2/G3 S3 S4 (This table is used to track modules covered by different groups in the different sessions). 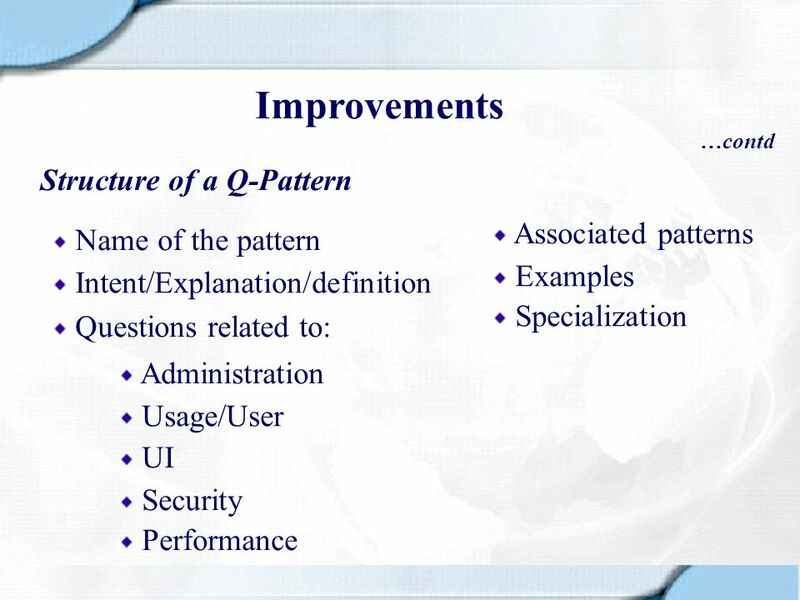 54 Improvements What are Q-patterns ? 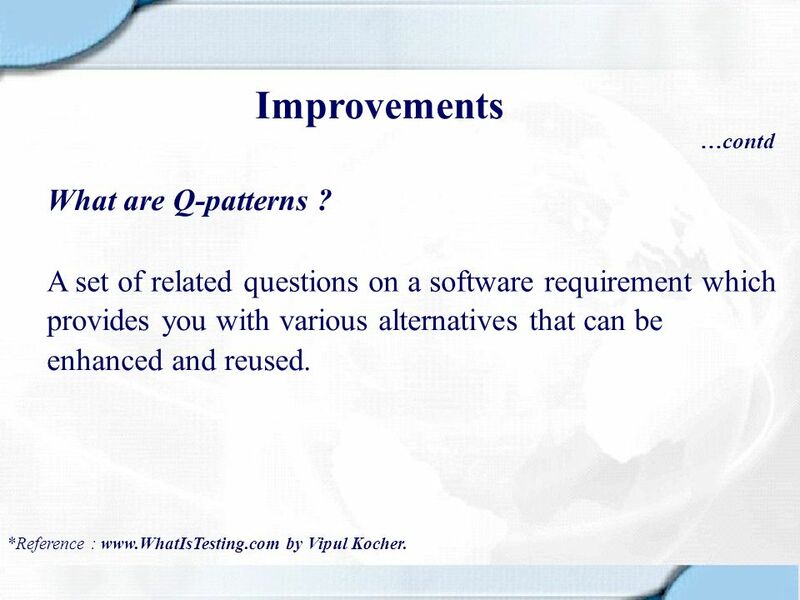 …contd What are Q-patterns ? 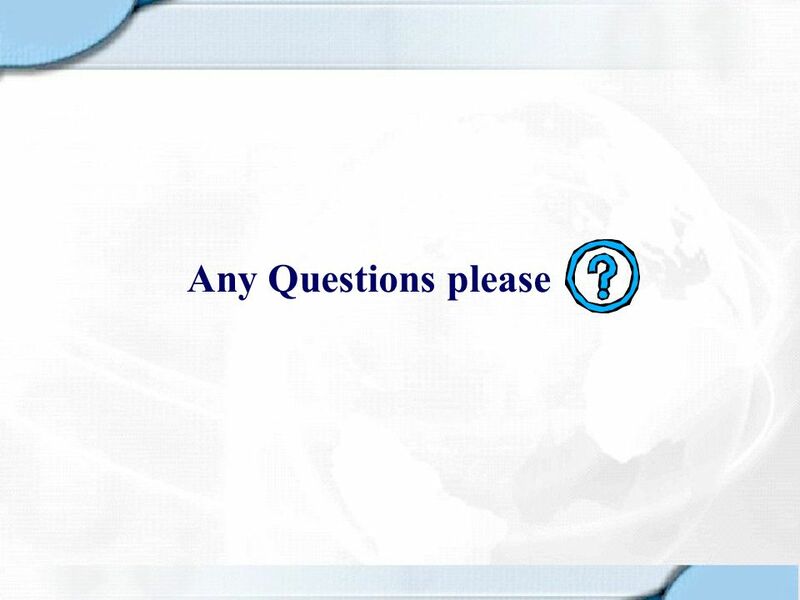 A set of related questions on a software requirement which provides you with various alternatives that can be enhanced and reused. *Reference : by Vipul Kocher. 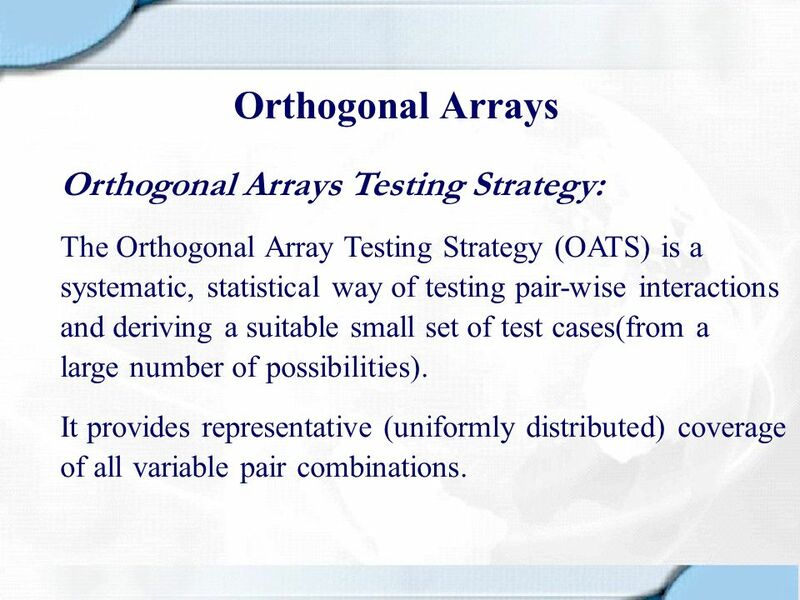 The Orthogonal Array Testing Strategy (OATS) is a systematic, statistical way of testing pair-wise interactions and deriving a suitable small set of test cases(from a large number of possibilities). It provides representative (uniformly distributed) coverage of all variable pair combinations. 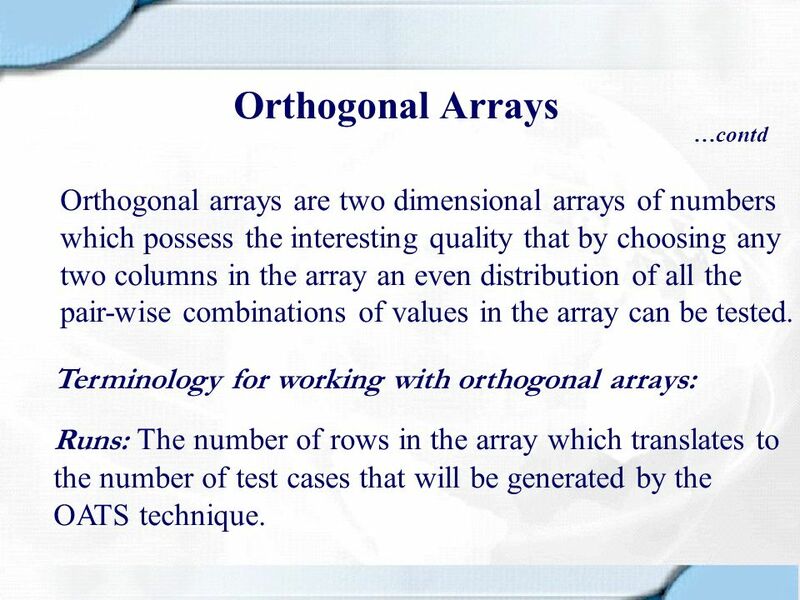 59 Orthogonal Arrays …contd Orthogonal arrays are two dimensional arrays of numbers which possess the interesting quality that by choosing any two columns in the array an even distribution of all the pair-wise combinations of values in the array can be tested. Terminology for working with orthogonal arrays: Runs: The number of rows in the array which translates to the number of test cases that will be generated by the OATS technique. 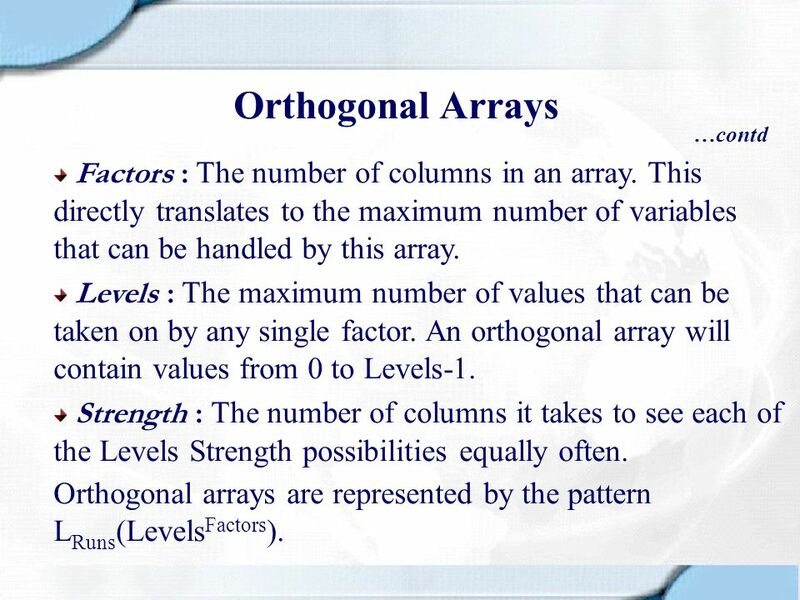 60 Orthogonal Arrays …contd Factors : The number of columns in an array. This directly translates to the maximum number of variables that can be handled by this array. Levels : The maximum number of values that can be taken on by any single factor. 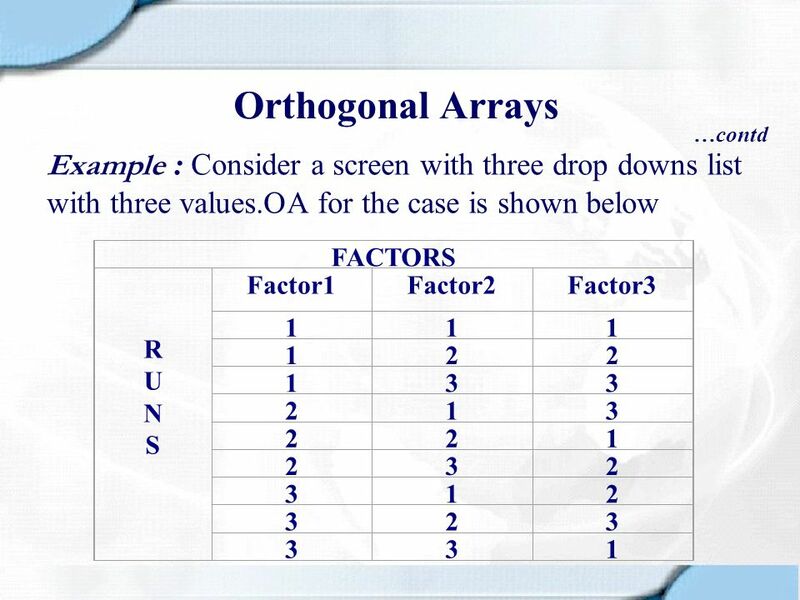 An orthogonal array will contain values from 0 to Levels-1. Strength : The number of columns it takes to see each of the Levels Strength possibilities equally often. Orthogonal arrays are represented by the pattern LRuns(LevelsFactors). 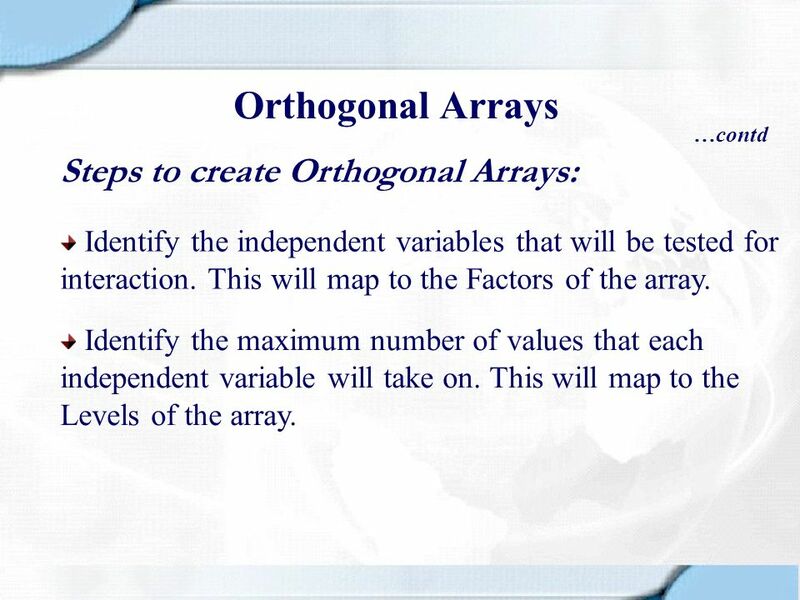 …contd Steps to create Orthogonal Arrays: Identify the independent variables that will be tested for interaction. This will map to the Factors of the array. Identify the maximum number of values that each independent variable will take on. This will map to the Levels of the array. 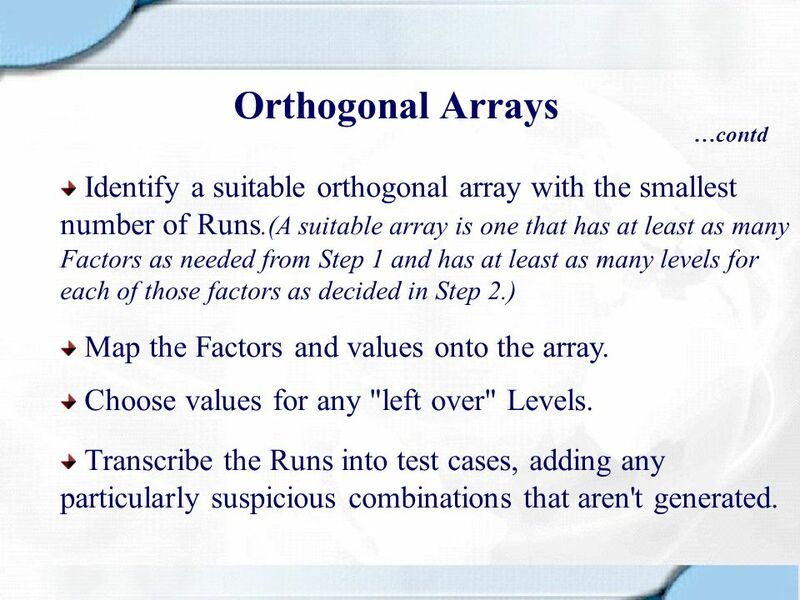 62 Orthogonal Arrays …contd Identify a suitable orthogonal array with the smallest number of Runs. (A suitable array is one that has at least as many Factors as needed from Step 1 and has at least as many levels for each of those factors as decided in Step 2.) Map the Factors and values onto the array. Choose values for any "left over" Levels. Transcribe the Runs into test cases, adding any particularly suspicious combinations that aren't generated. 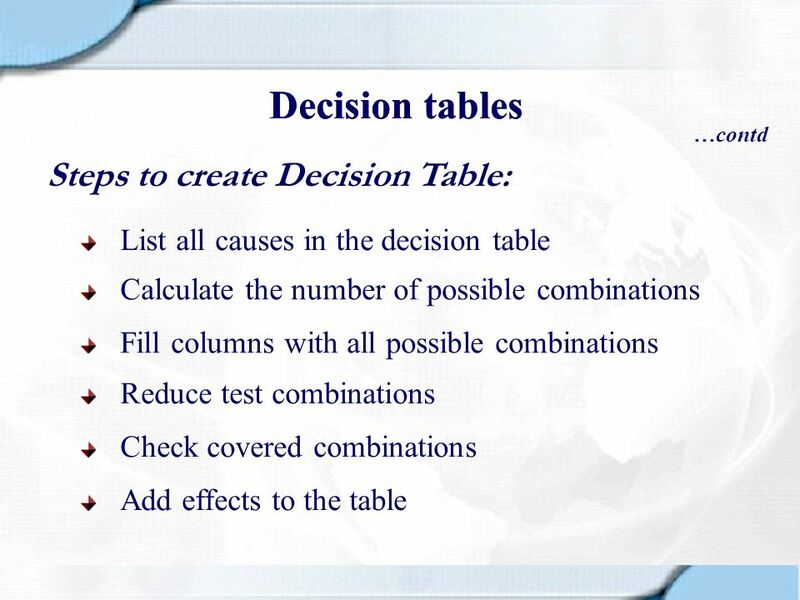 64 Decision tables What are decision tables ? 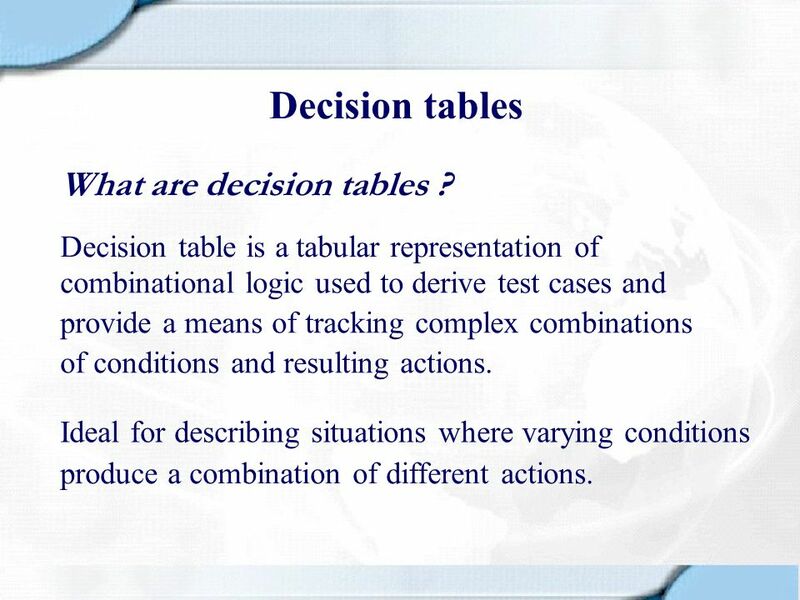 Decision table is a tabular representation of combinational logic used to derive test cases and provide a means of tracking complex combinations of conditions and resulting actions. Ideal for describing situations where varying conditions produce a combination of different actions. 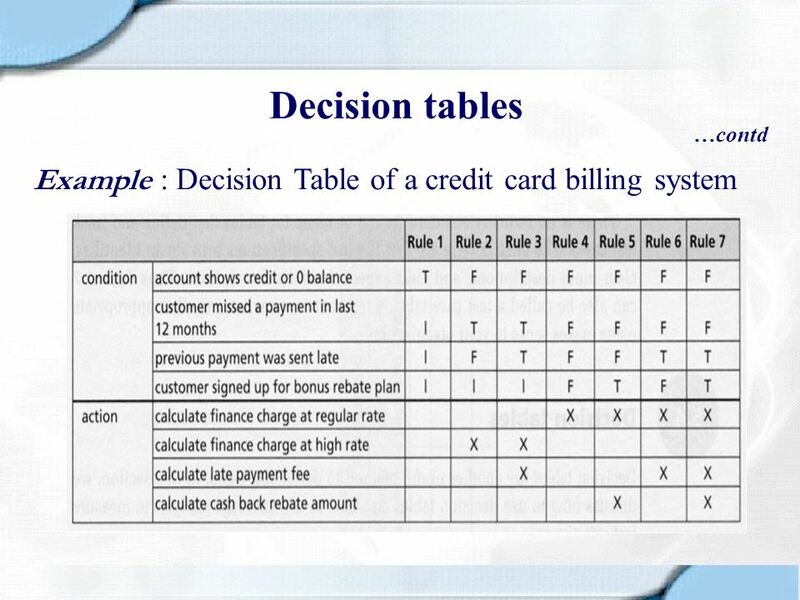 65 Decision tables Why use a Decision Table? 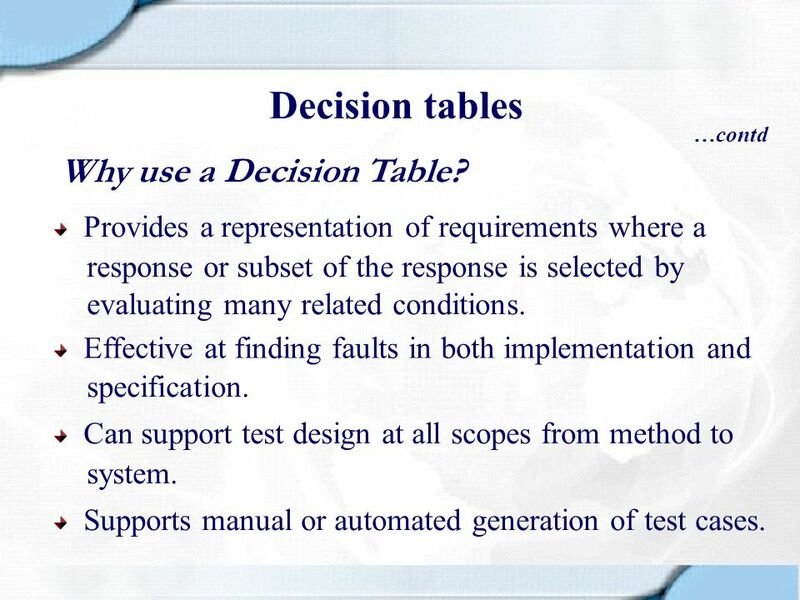 …contd Why use a Decision Table? Provides a representation of requirements where a response or subset of the response is selected by evaluating many related conditions. Effective at finding faults in both implementation and specification. Can support test design at all scopes from method to system. Supports manual or automated generation of test cases. 68 State Diagrams What are State Diagrams ? State diagrams show the dynamic behaviour of a system. 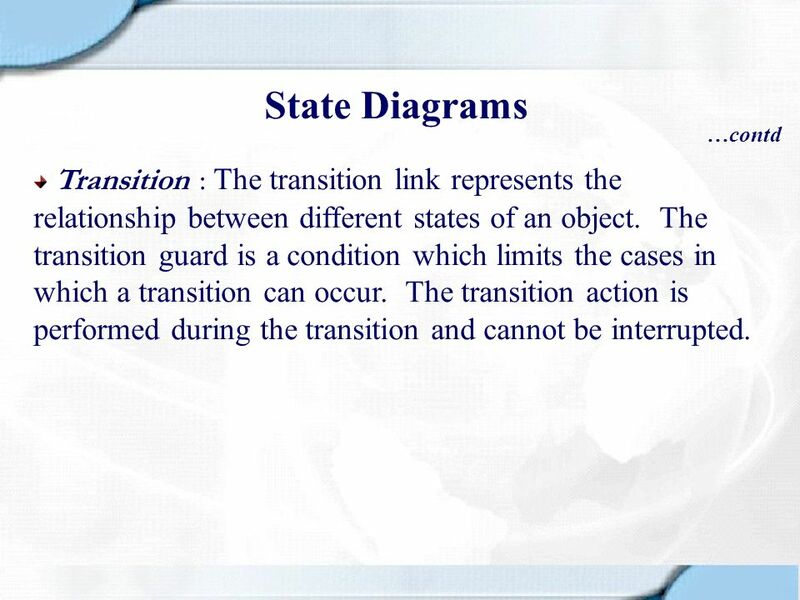 The diagram shows the various states that an object can get into and the transitions that occur between the states. 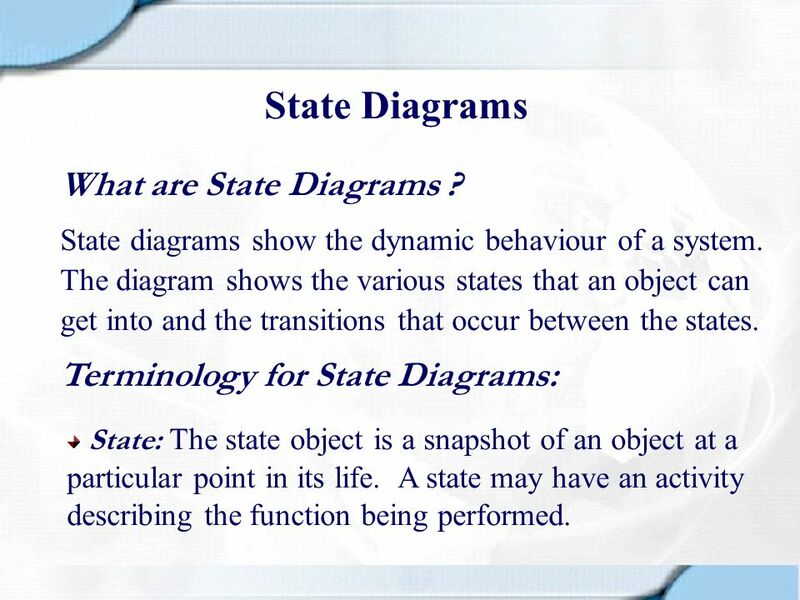 Terminology for State Diagrams: State: The state object is a snapshot of an object at a particular point in its life. A state may have an activity describing the function being performed. 69 State Diagrams …contd Initial State : The initial state is the starting state of the object with reference to the behaviour that the diagram explains. Each state diagram should have only one initial state. 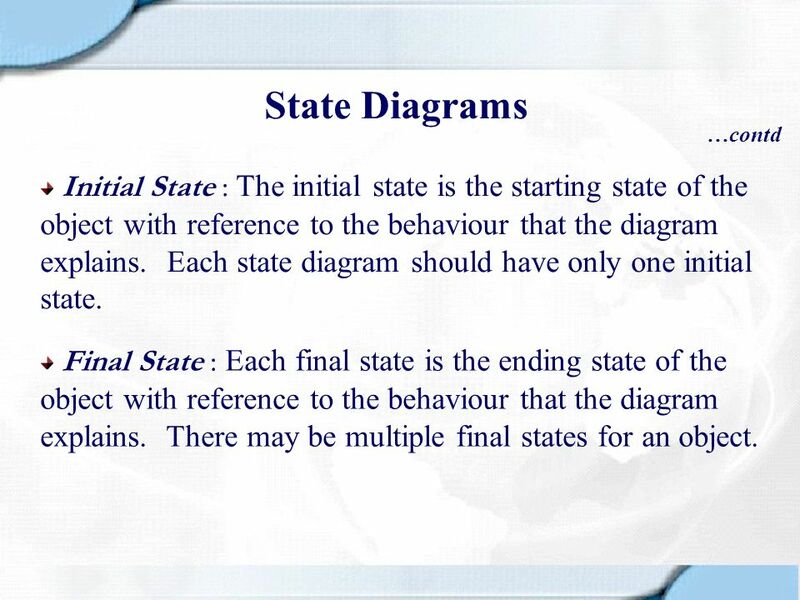 Final State : Each final state is the ending state of the object with reference to the behaviour that the diagram explains. There may be multiple final states for an object. 70 State Diagrams …contd Transition : The transition link represents the relationship between different states of an object. The transition guard is a condition which limits the cases in which a transition can occur. The transition action is performed during the transition and cannot be interrupted. 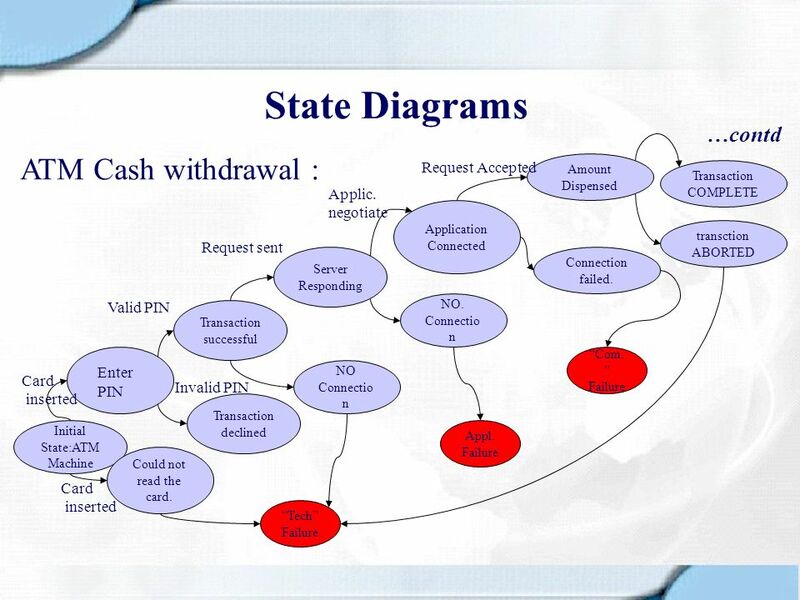 71 State Diagrams ATM Cash withdrawal : …contd Request Accepted Applic. 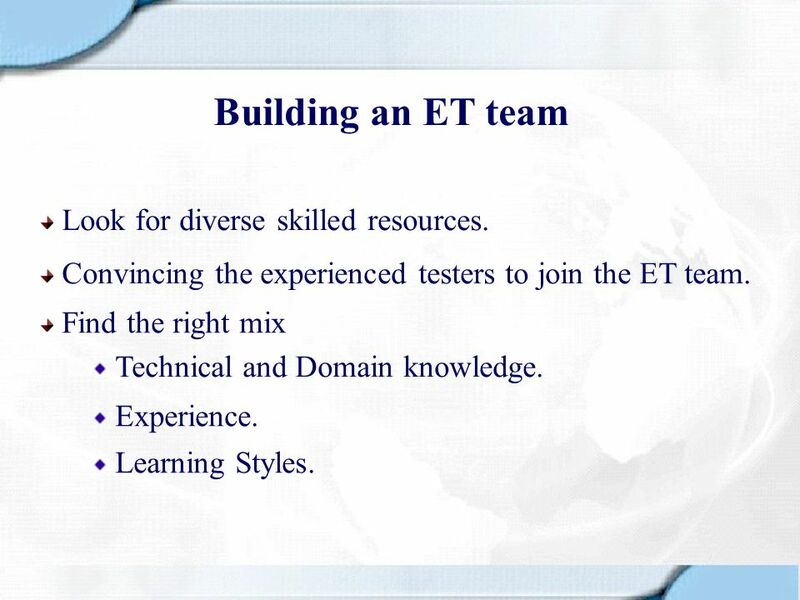 73 Building an ET team Look for diverse skilled resources. Convincing the experienced testers to join the ET team. Find the right mix Technical and Domain knowledge. Experience. Learning Styles. Decide the charters and sessions. Decide the risk factors involved. Hold debriefing sessions. Deciding the strategies for ET. Prepare the metrics. Maintaining the morale of the team. Updating the Q-Patterns. Resource allocation. 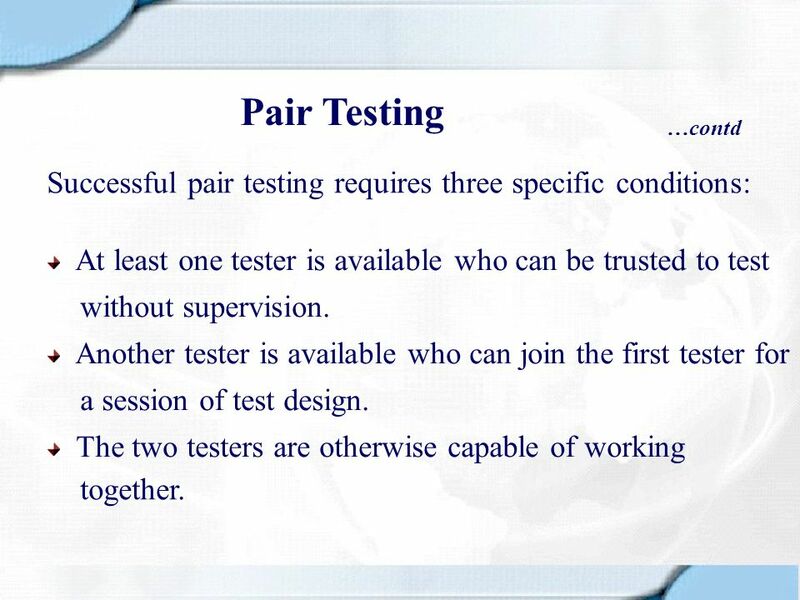 76 Pair Testing …contd Successful pair testing requires three specific conditions: At least one tester is available who can be trusted to test without supervision. 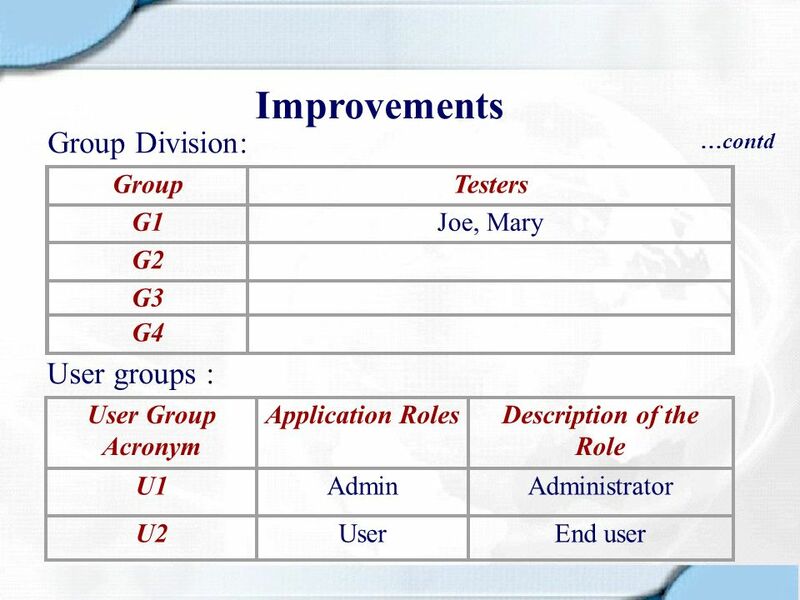 Another tester is available who can join the first tester for a session of test design. 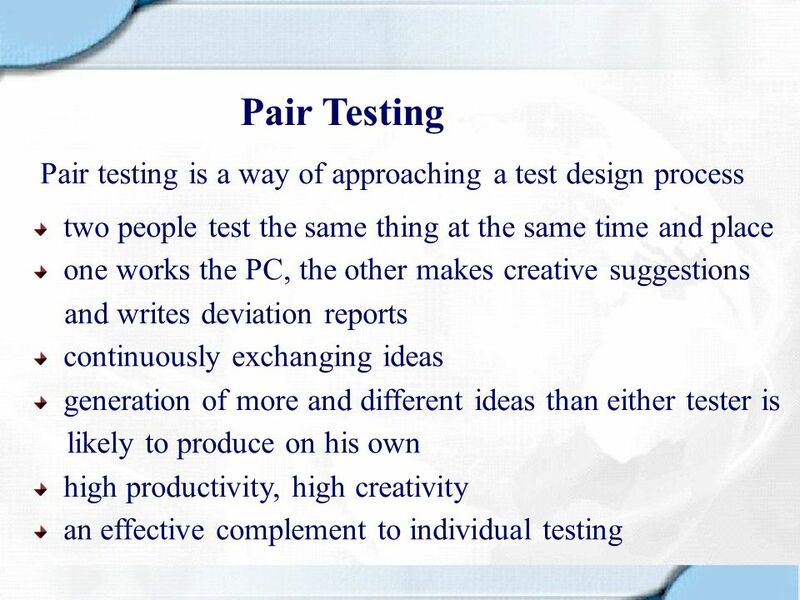 The two testers are otherwise capable of working together. Informal QC groups meetings to discuss the learnings, experience and suggestions for improvement. Assigning challenging and varied tasks to avoid monotony. 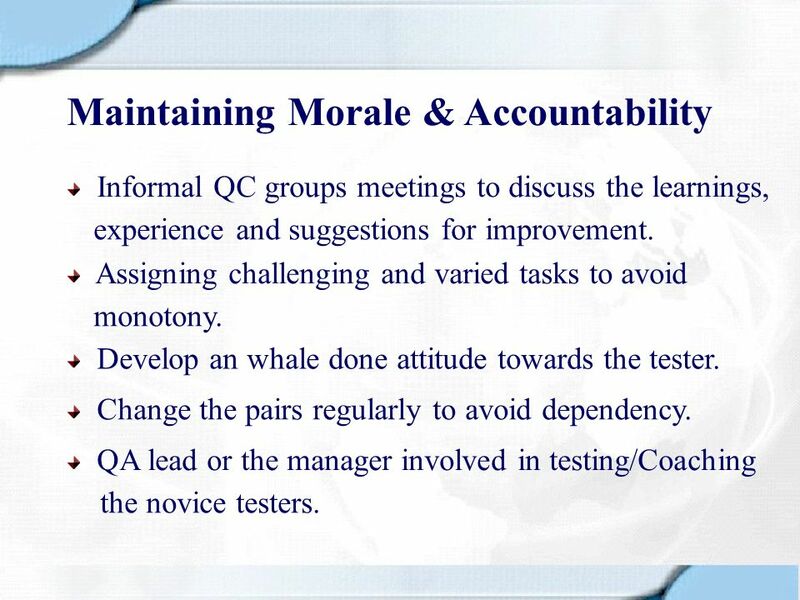 Develop an whale done attitude towards the tester. Change the pairs regularly to avoid dependency. 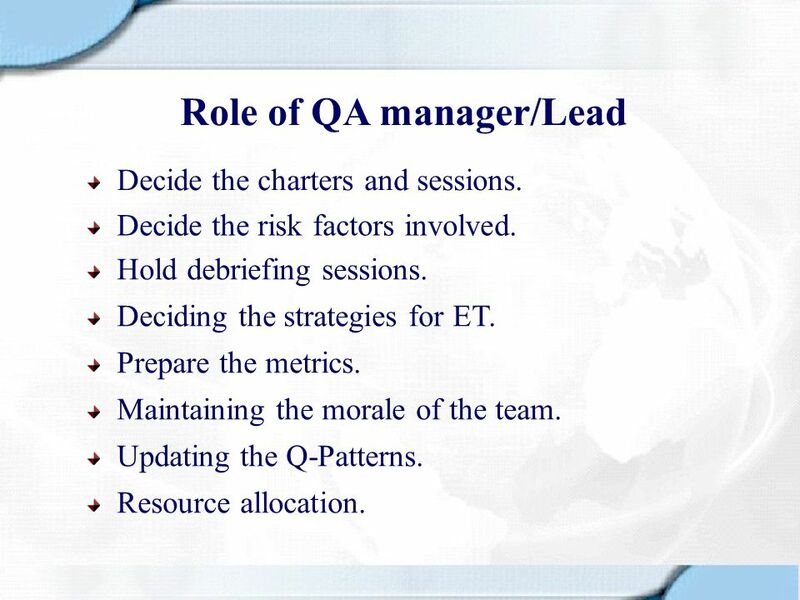 QA lead or the manager involved in testing/Coaching the novice testers. Download ppt "Exploratory Testing – an improved approach"
Constructing a Task List ITSW 1410 Presentation Media Software Instructor: Glenda H. Easter. R R R CSE870: Advanced Software Engineering (Cheng): Intro to Software Engineering1 Advanced Software Engineering Dr. Cheng Overview of Software Engineering. Stoimen Stoimenov QA Engineer QA Engineer SitefinityLeads,SitefinityTeam6 Telerik QA Academy Telerik QA Academy.